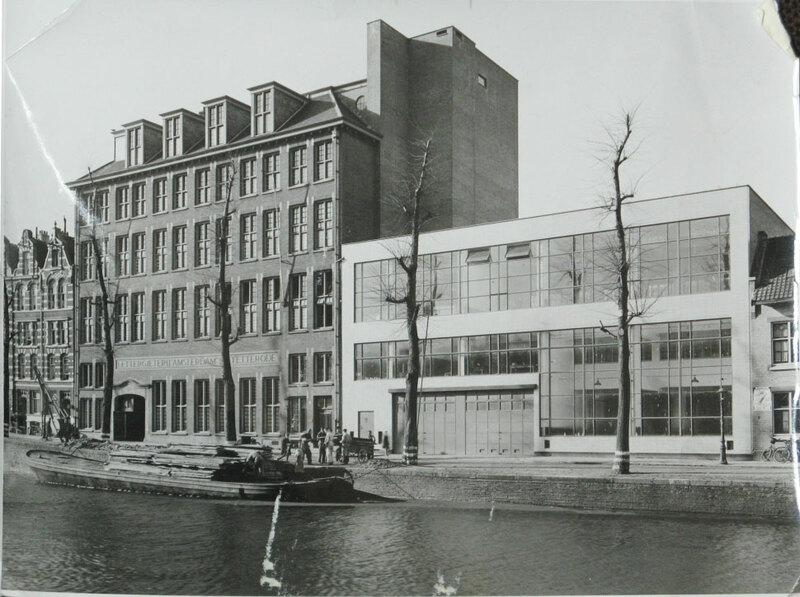 The large eastern block [dc] facing the Dacostakade canal consists of two joined buildings: the 1912 Hartkamp [hc] and the 1949 Merkelbach [mb]. 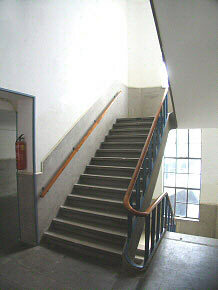 The two buildings have 8 levels in common. 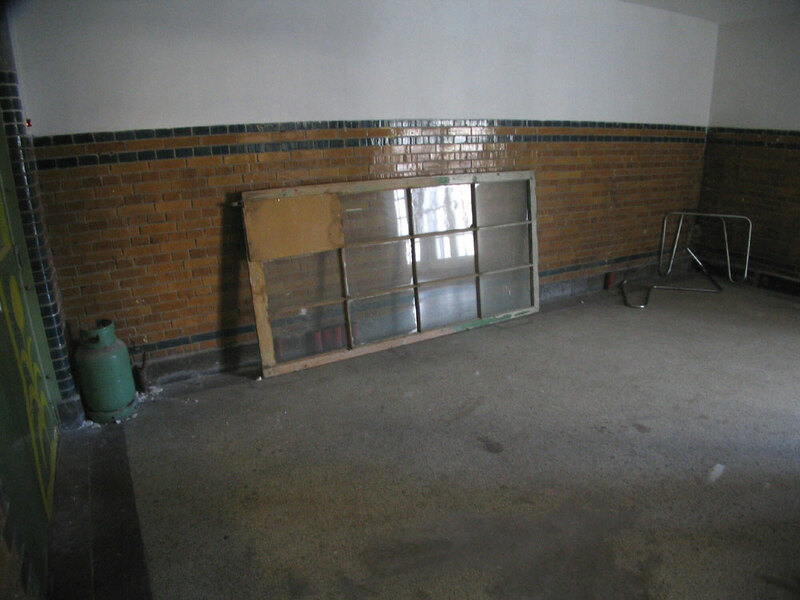 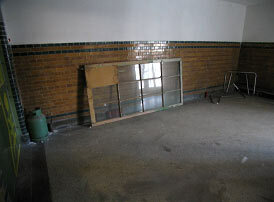 Below ground [L0-1] are rented basement work-spaces, mainly on the Merkelbach side. 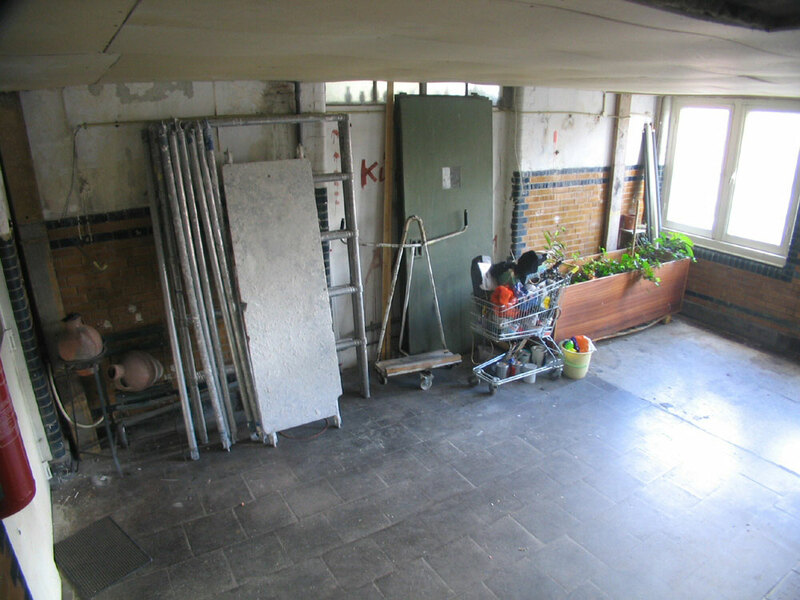 Ground level [L0] is workshops in Merkelbach, the Dijk Theatre and small businesses in Hartkamp. 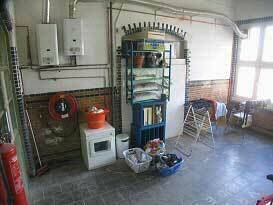 L1 (known as the "Entresol" because of its relative shallowness) is businesses in Merkelbach, apts in Hartkamp. 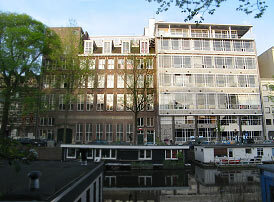 Above L1 both buildings have five apt floors [L2 to L6]. 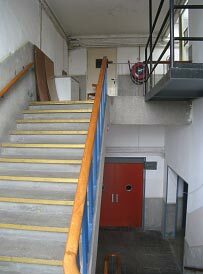 L5 is the last lift-stop and from there one climbs the stair to the last apt level [L6]: the mb/hc ‘penthouse’. 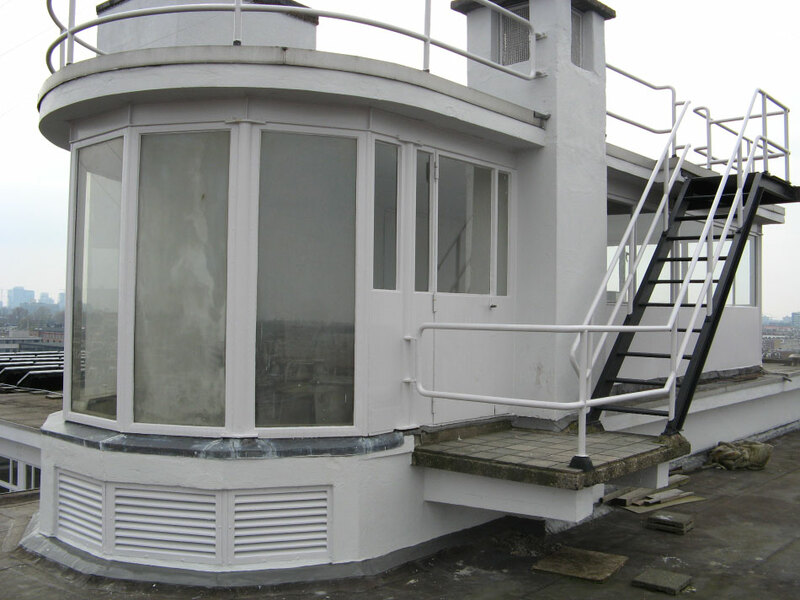 Above this rises only a small glass 'look-out' pavilion [L7] with a stair to its roof terrace and radio tower [L8]. 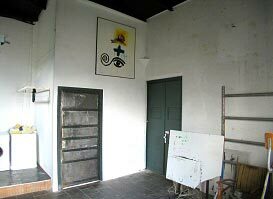 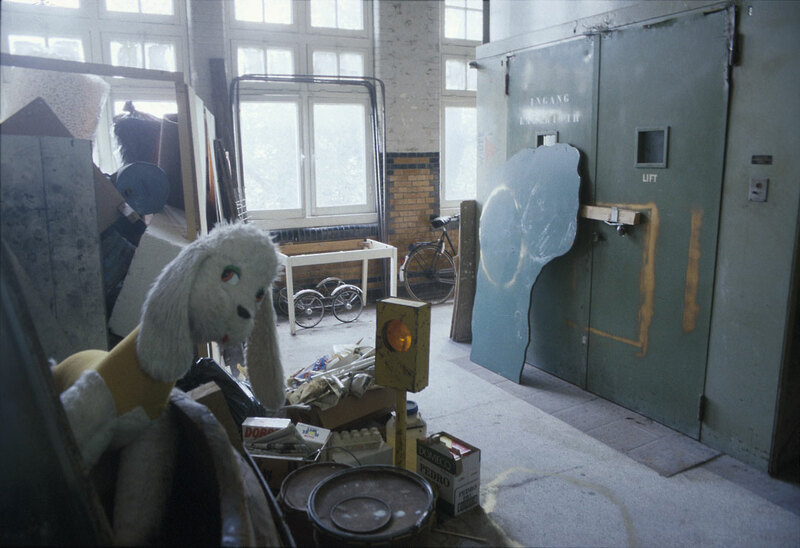 This whole Dacostakade side of Tetterode developed largely as one in its pre- and early-domestic phases: starting as flimsily divided artists studios, changing in the late 1980s to a live-in situation: a mix of apt and studio space divided by solid walls. 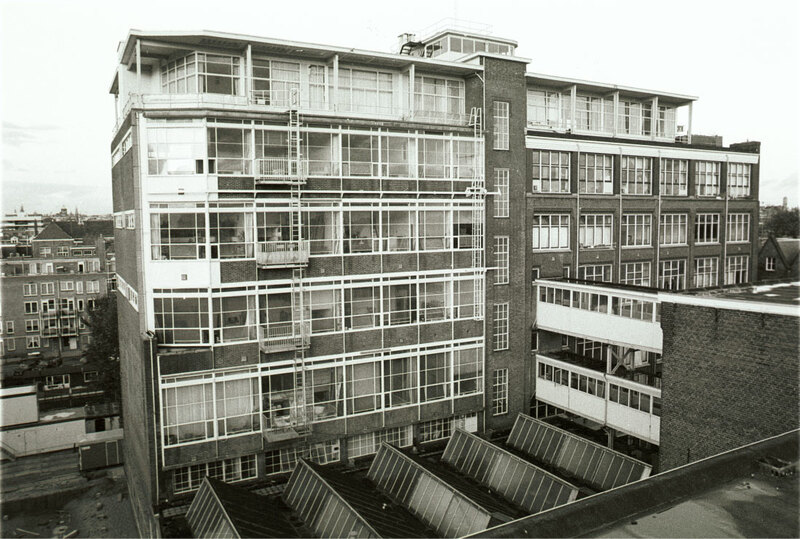 Since then the buildings have diverged (curiously in tune with their architectural character). The Merkelbach [mb], a building that gives the impression of single-minded dedication to work, is still artist/studio dominated, whereas the older Hartcamp building [hc], that dallies with ‘domestic’ styles, is now socially mixed and (like the Bilderdijk [bd] block) has devolved into socially different floors, more densely occupied than Merkelbach’s, with smaller and more intricate spaces. 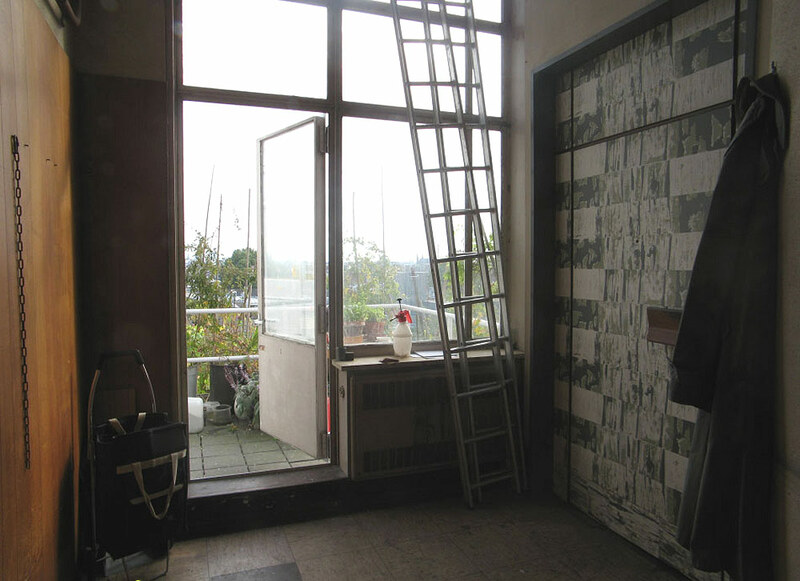 Its less industrial character has allowed the sense of domesticity to accumulate, while the monolithic austerity of Merkelbach has not been contradicted. 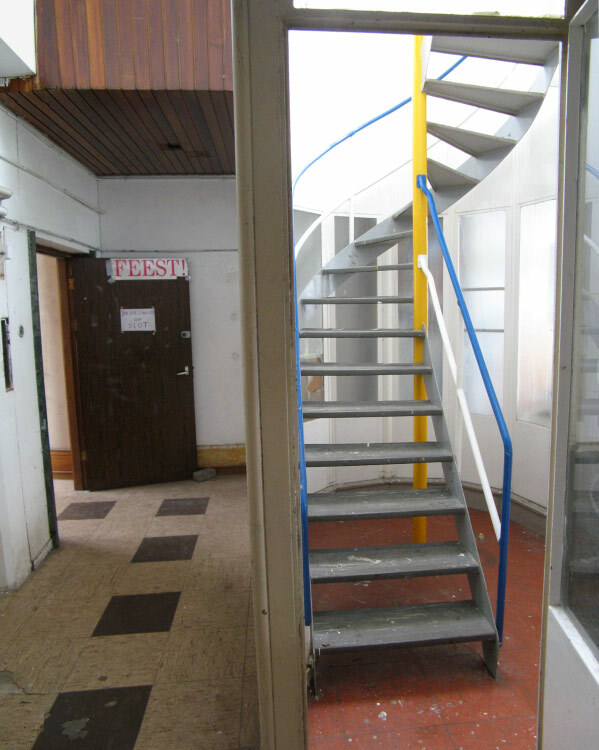 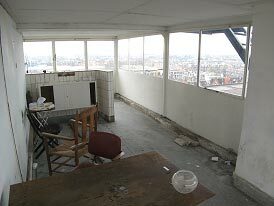 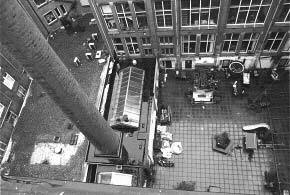 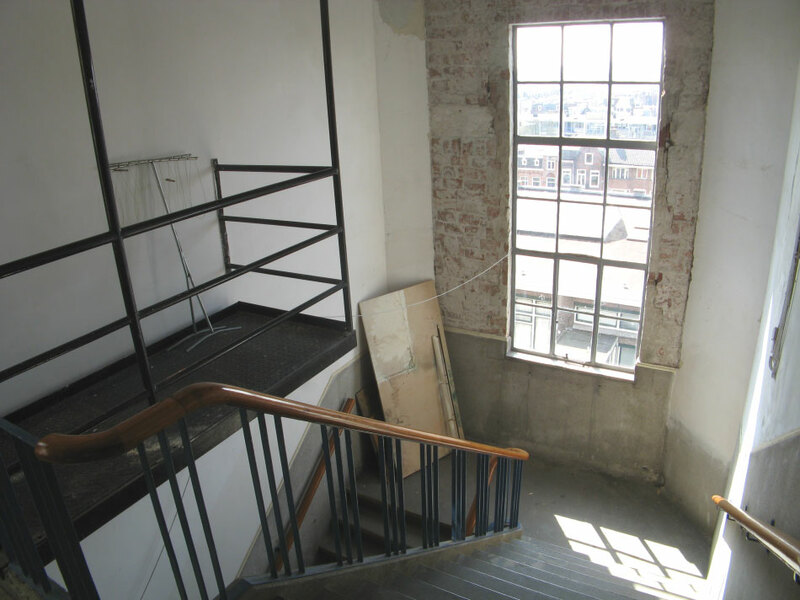 A picture taken when Merkelbach's first workshop building was completed but before the Hartcamp south stair was extended upwards to (presumably) serve the L6 1963 penthouse. 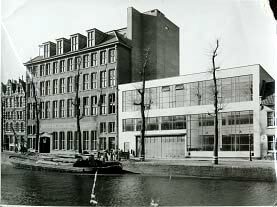 In 1949 Merkelbach was finally able to complete his building. View across the Dacostakade canal of the east facade of the [dc] block. 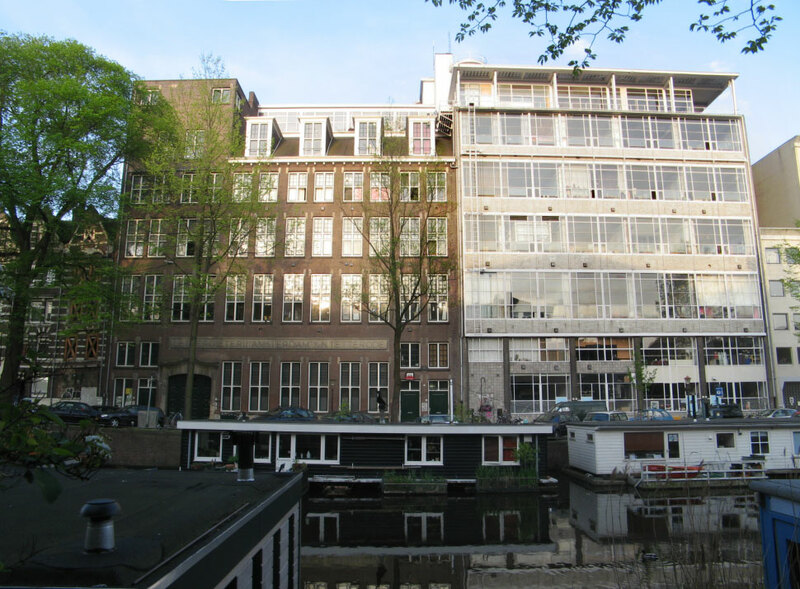 1912 Hartcamp [hc] shows its 'domestic' face (presumably supposed to 'complement' Dacostakade's 19C housing blocks) while 1949 Merkelbach [mb] flaunts an easthetic of economy that renders 'factory' as elegant a function as any other (a value endorsed by the grandeur it affords its presently infesting apartments). 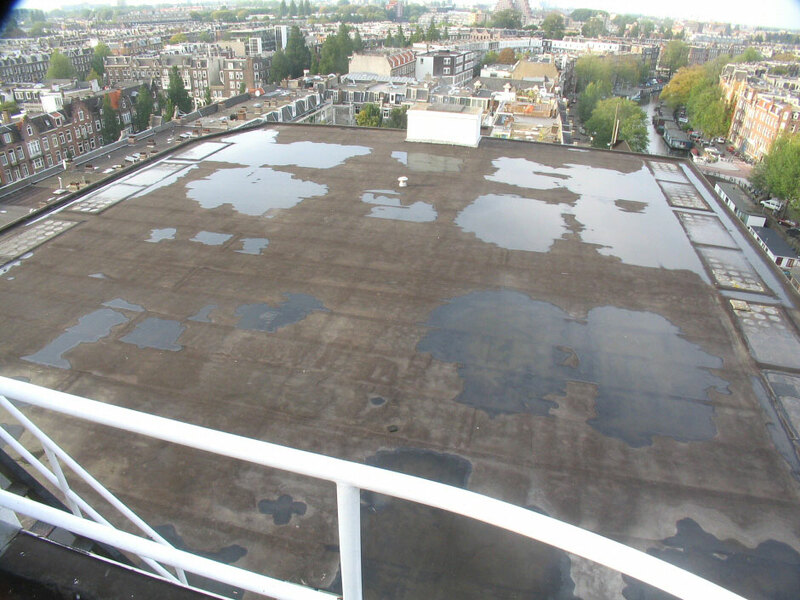 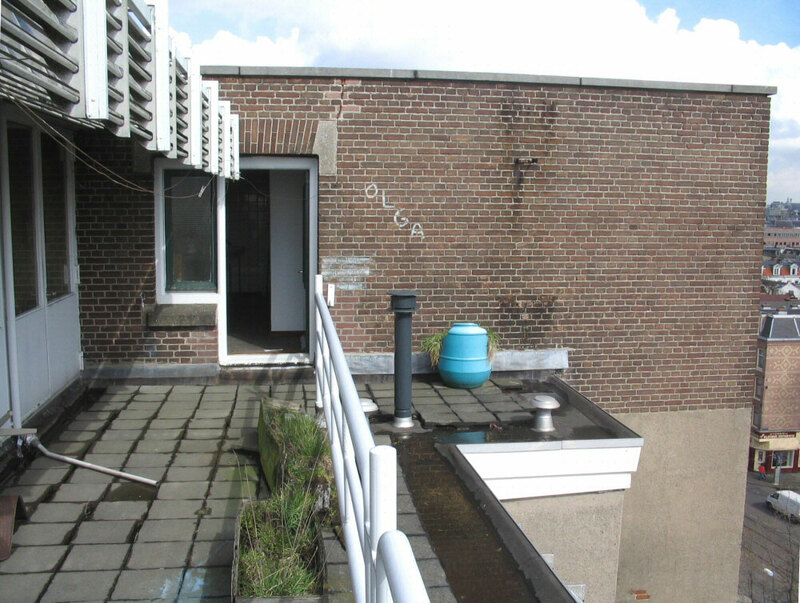 We are are looking across at the inner facade of the Dacostakade [dc] block from the Bilderdijk [bd] block's roof. 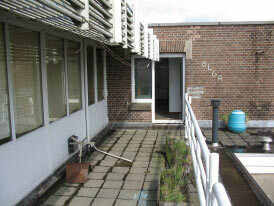 At their N and S ends workshops link the two blocks, south of the connecting bridges they share Tetterode's enclosed courtyard. 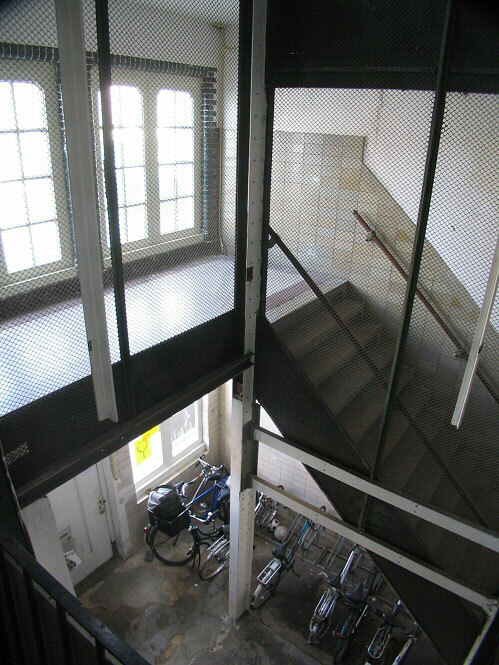 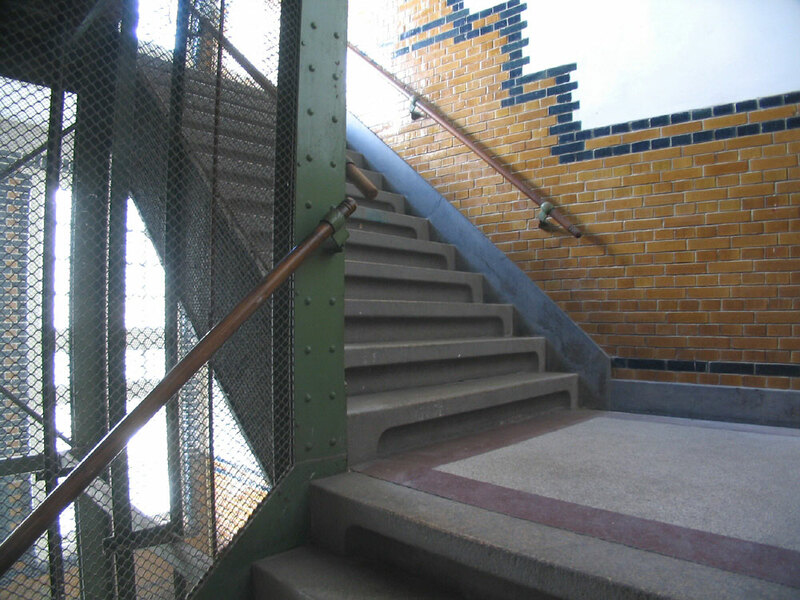 The Dacostakade block's north half, the 'Merkelbach' building [mb] and its south half, the 'Hartkamp' building [hc], share a central stair/lift from which the two bridges cross to Bilderdijk. Workshops obscure Merkelbach's ground level L0; just above their roof are the thin windows of the uniquely shallow floor L1, the so called "entresol" - in Merkelbach it is occupied by workshops and businesses, in Hartcamp by apts. 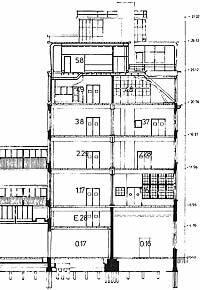 Above it are L2/3/4/5: four levels of apts, studio-apts, or studios - arranged on each side (and in Merkelbach across the ends) of central passages branching from the centre stair. 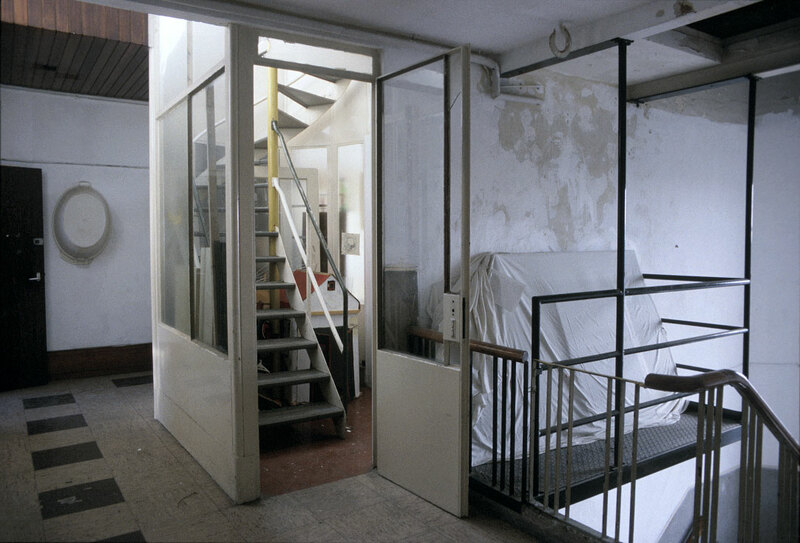 Over all is L6: the penthouse, its Hartkamp portion a single studio-apt, the larger Merkelbach portion divided into 3 studio-apts entered from an external terrace (a tiny & unique 'row-house' situation). 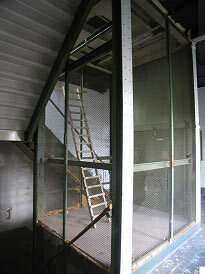 Surmounting all is the tiny 'look-out' room L7 and its L8 roof with Tetterode's radio-aerial. Entering at Dacostakade 158 on the edge of the old building (perhaps with a key on a kite-string thrown from a high window) one traverses a bent passage that squeezed the mis-calculated theatre-wall into a curve flanked by terminal ‘rustication’  - the strange wall is flush-set with panels of face-height glass and mirror, redeeming the mistake as ‘art’: the introduction to the severe and serious practicality of Merkelbach. 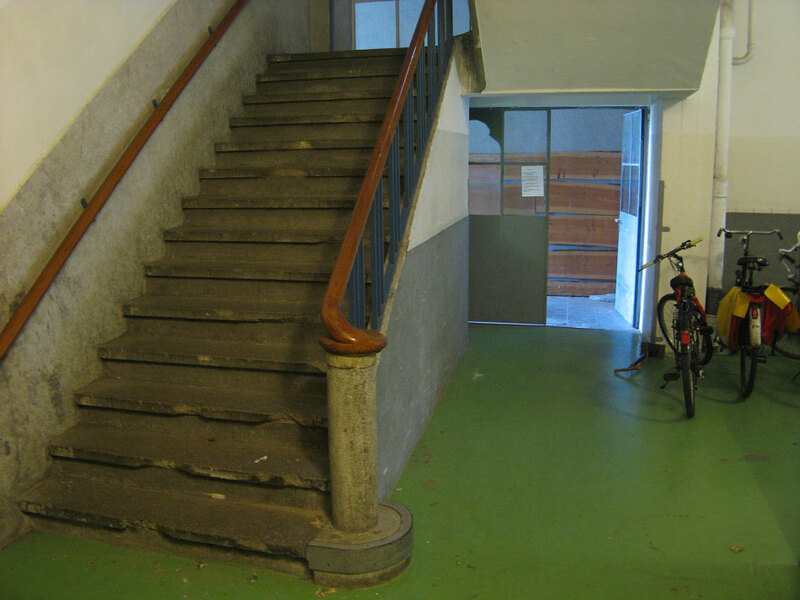 If one misses the lift and stair one can wander into a ground floor that is a confusion of junctions between disparate places and routes, left-overs of piecemeal enclosures (mostly of workshops), winding across the width of the site in a single-story muddle of layered bikes and ad hoc conversions strangely giving way to 1920s panelling, mirrors and marble, a silent cool empty fossil foyer opening into the traffic-roar of the Bilderdijkstraat . 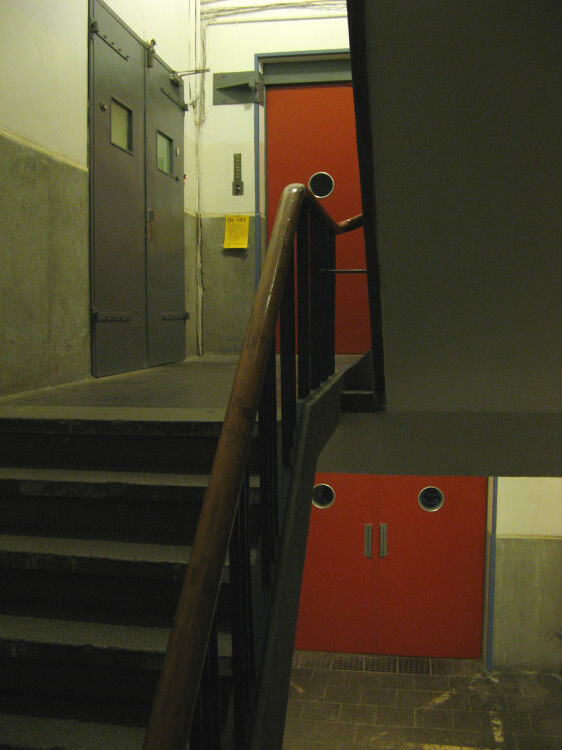 The lift in its cluttered dark corner (opposite uninvitingly large stairs - they have the scale of climbing a house between each floor) stares orange out of its doors’ eyes: steel-rimmed portholes open into a blood red box lit by a tungsten bulb; heavy steel doors swing open as if to a banqueting room. 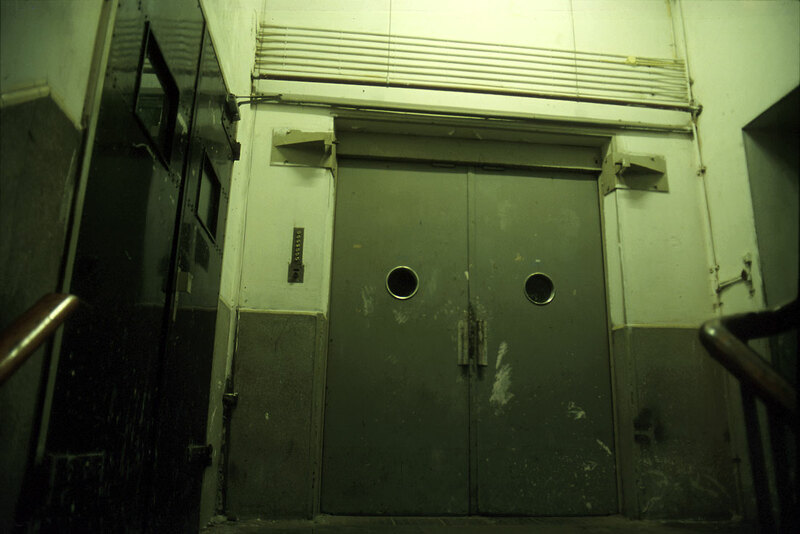 One rises past the inside lips of floors and daylight-flashing ports in numbered doors . On five lift-levels the smooth valves of the lift doors are flanked by locked and belled floor doors - riveted, with strap-hinges, severe rectangular stares and small handle-noses. 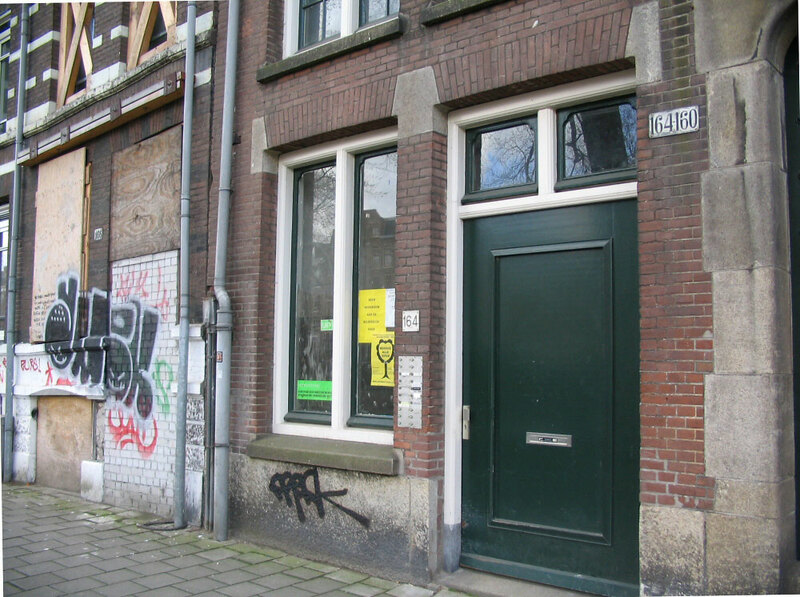 Each leads into a floor-enclave: 1949 Merkelbach on the west hand, 1912 Hartcamp on the east. On these landings one can feel stranded high-up in a senseless place locked out of Tetterode’s inner life. 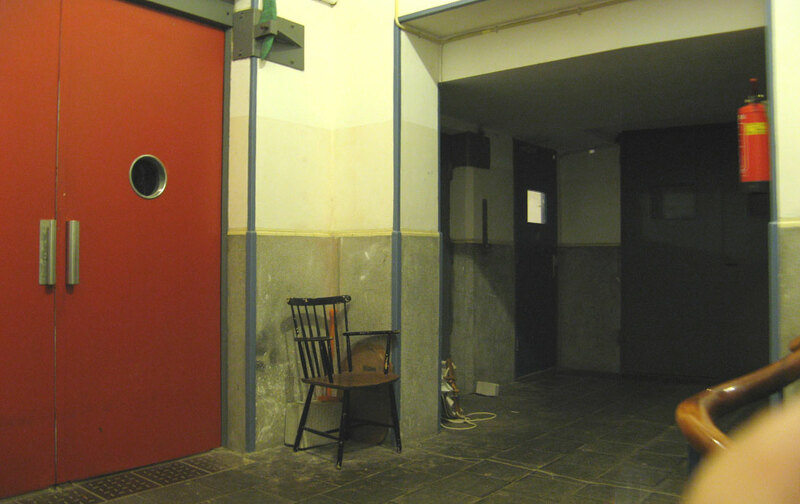 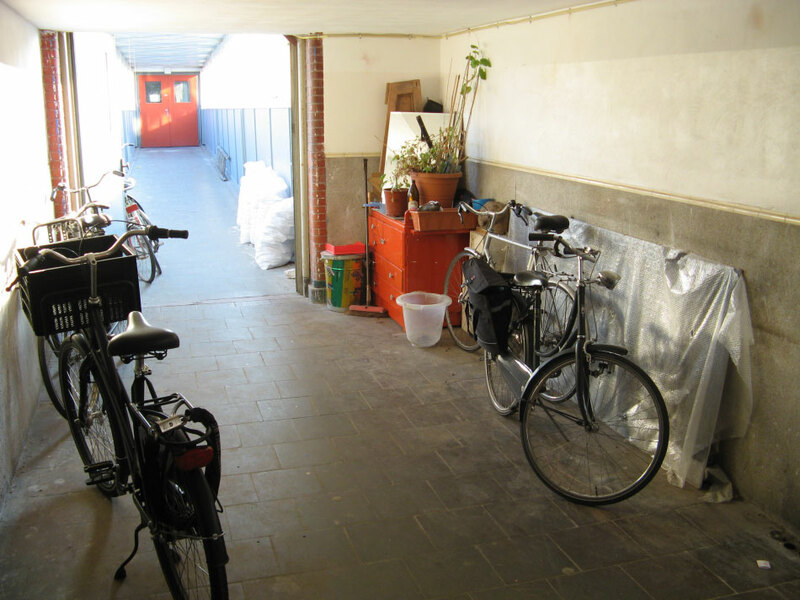 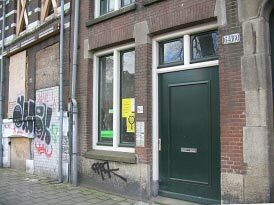 However once inside there is rarely the communal sense of the Bilderdijk enclaves; on all these floors a more or less straight central passage serves the living-spaces, doors to the right, left, and end. 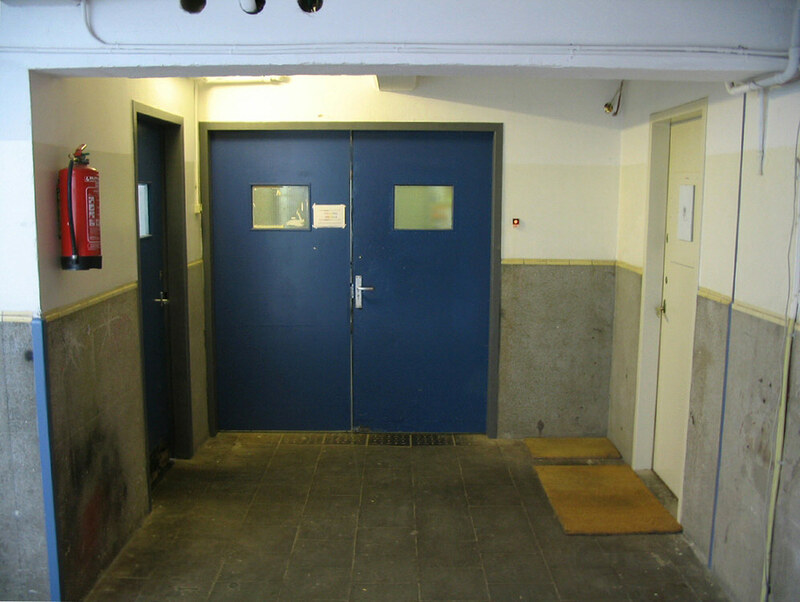 In Merkelbach especially even these inner doors are almost always closed and often locked: there is a working rather than domestic atmosphere...it feels as if the severe concrete floors/ceilings and the cement-block and boarded walls are too simple to hide rich and complex apartments, they resemble those in studio-converted warehouses. 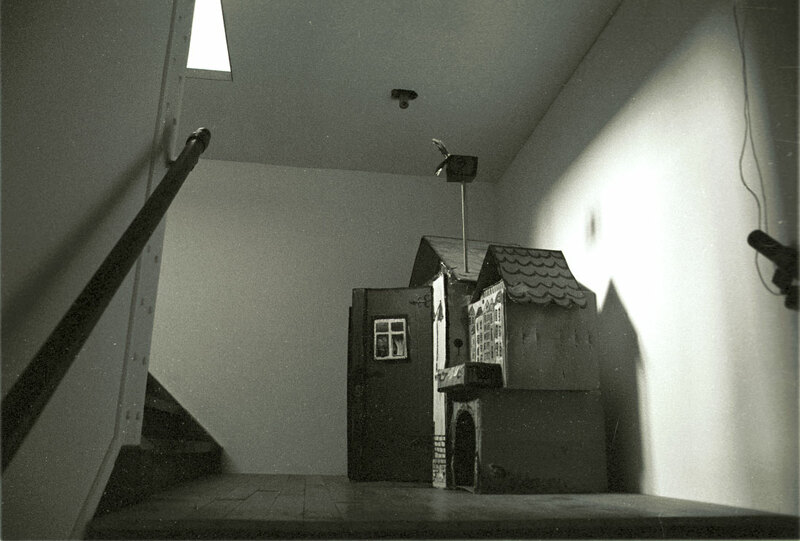 Indeed in 1985 the Collective had decided to reserve Merkelbach for studios and relocate studios when vacated in other buildings...distilling domesticity. 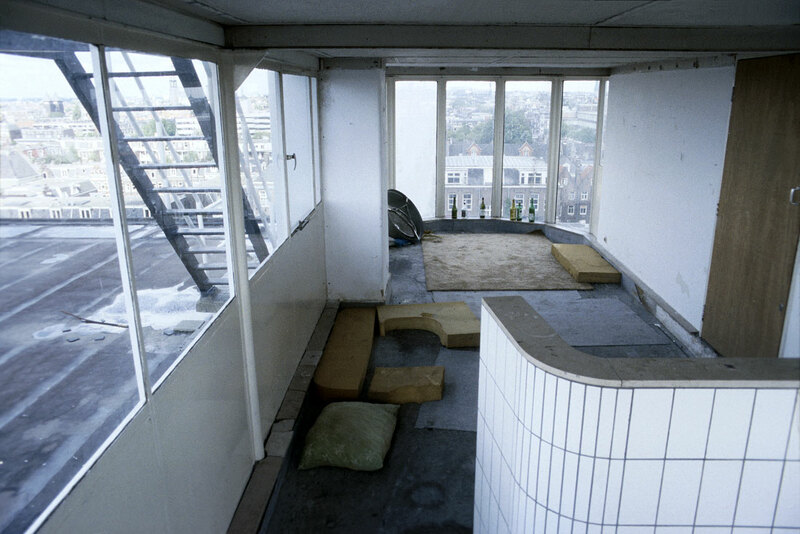 However in spite of this policy, by 1994 Merkelbach had at least 13 living-spaces among its studios, and behind its austere inner facades are some of the most developed and ambitious apts in Tetterode.. After the ‘86 legalisation a ‘stick and carrot’ situation pertained: the new rents (approx 1000% rise over squat levels) and the inducement of Het Oosten’s internal renovation fund precipitated an intense period (‘87-’88) of building - except for two spaces walled in ‘85, divisions had previously been plastic curtains or flimsy wood and board, now everywhere was divided by cement-block walls. Separation of work and home was financially unsustainable - apartment construction was stimulated and the huge studio spaces differentiated internally or were simply divided into work and domestic portions. 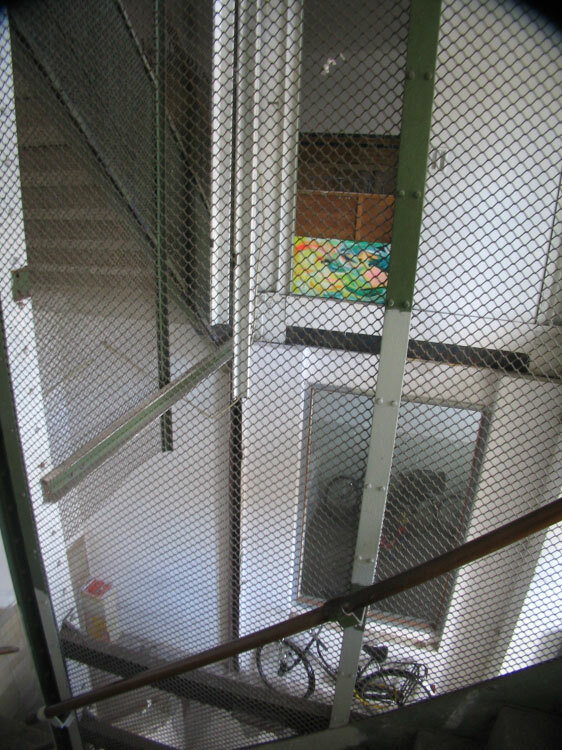 Dacostakade's highest living level (mb-L6/hc-L6) is a steel and glass-walled ‘penthouse’ that opens north and south from the top landing of the central stair. 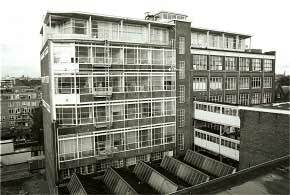 Its Merkelbach wing was the workers' canteen, stepped back under a shading roof and served by a railed pavement - now divided into three magnificent studio/apartments. 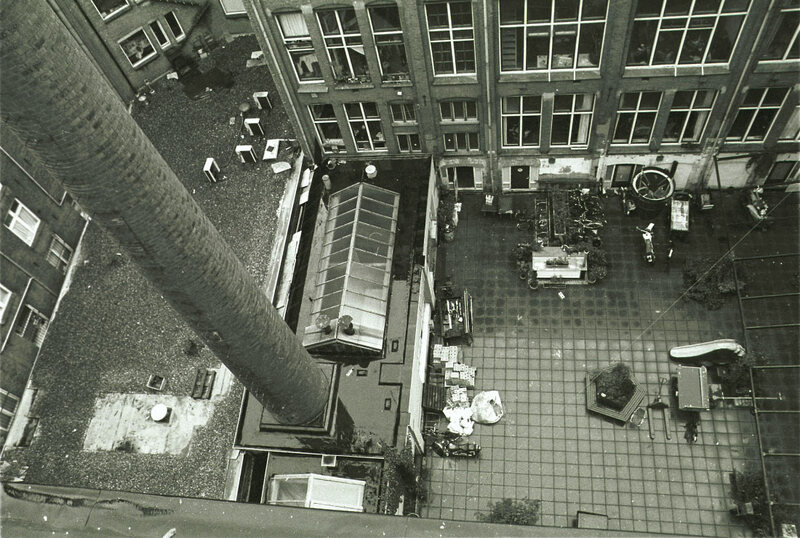 Its 1963 extension across the Hartcamp building was the ‘directors dining-suite’ which terminates at its S end in a little glass room shaded under the slatted ‘bris-soleil’ of its extended roof, opening on a terrace rimmed with a steel ships rail - guarding a dizzy drop into the central courtyard with its long brick chimney rising up and past - now a grass lawn strewn with a child’s toys and edged with flowers - a ‘suburban garden’ absurdly high above the domestic roof-tops of the Kinkerstraat. 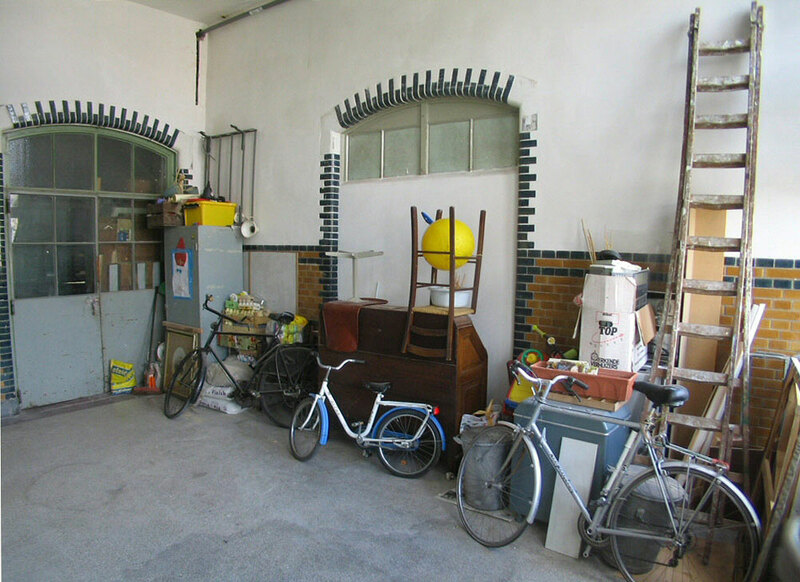 Almost since the squat’s inception the glass room has been the bedroom of Frank April, and the adjoining ‘dining-room’, now a single huge decor-stripped space with an oil-drum wood-stove, his studio/living-room. 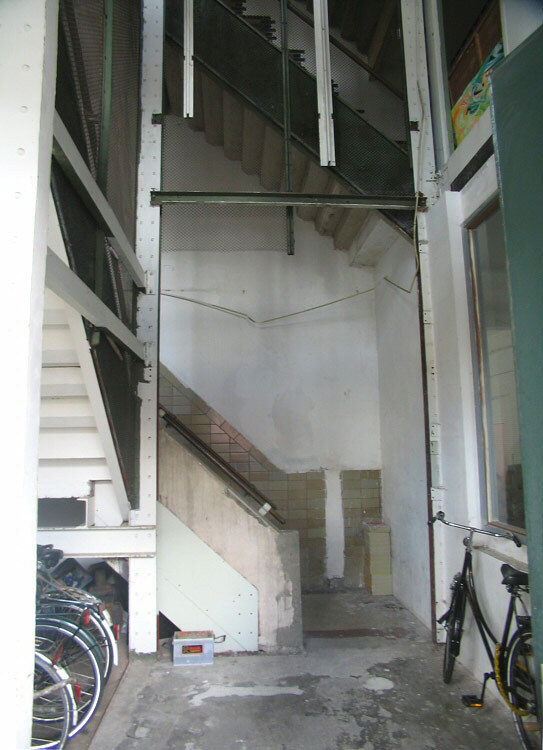 The little “sky-garden” is a Collective place - the termination of a stair that winds down Hartcamp's south east corner to street entry Dacostakade 164, serving as exclusive access to every Hartcamp enclave level below. 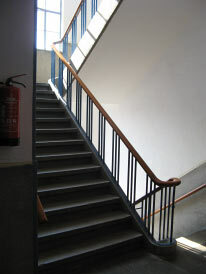 The climb to Tetterode's ultimate peak begins between the two wings of the ‘penthouse’. 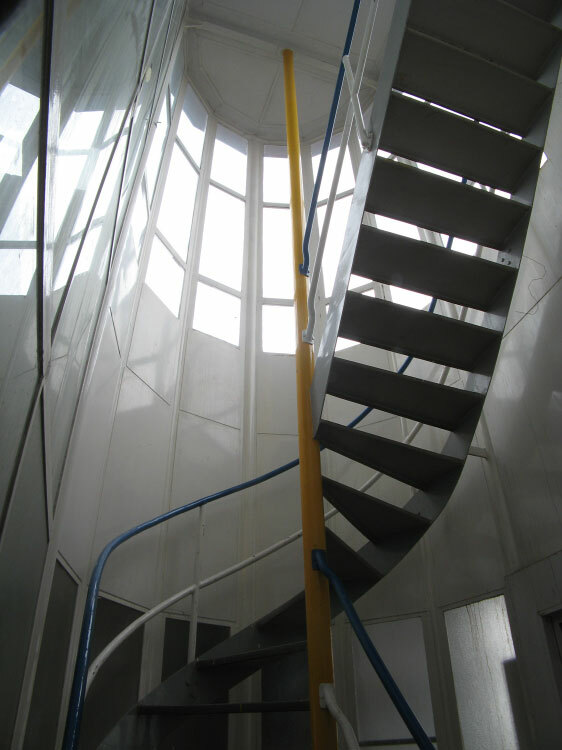 An elegant steel stair twists up into a tiny glass pavilion like the ‘look-out’ of an airship, furnished with mats and empty wine bottles. 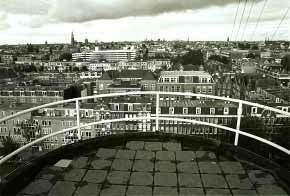 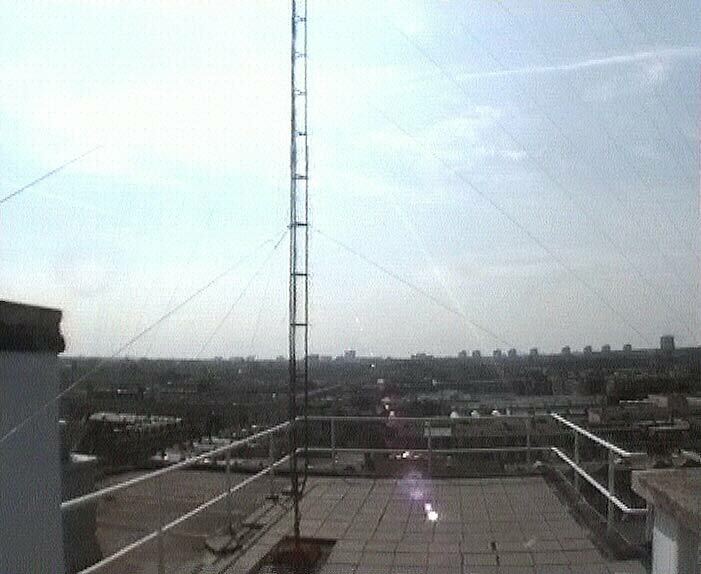 Outside and higher still up steel steps, one stands on its head at 31 metres - Tetterode’s final platform but not its highest point, here a 12½ metre lattice radio transmission mast rises and the whole horizon of Amsterdam surrounds it. 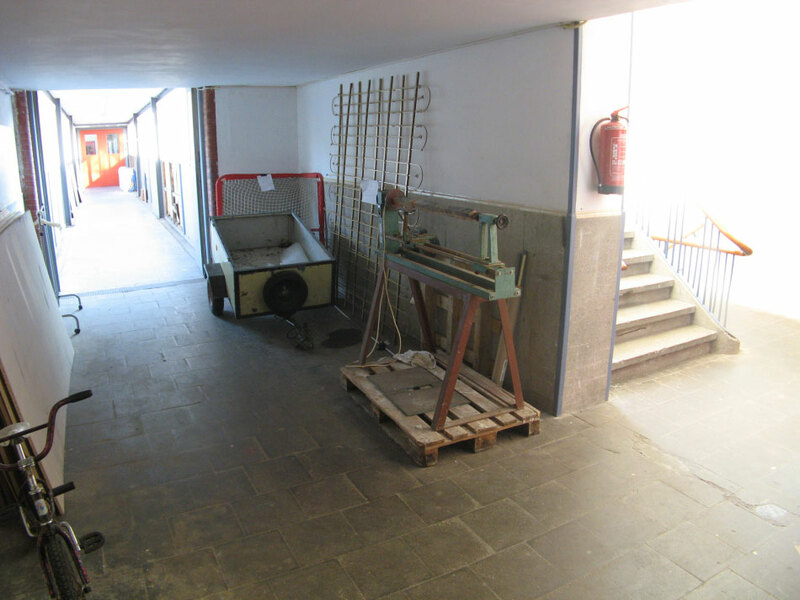 It was said that it took “half a year” to mutually decide to re-build the wall “five centimetres back” to allow access through the passage for trolley-carts! 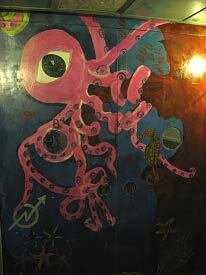 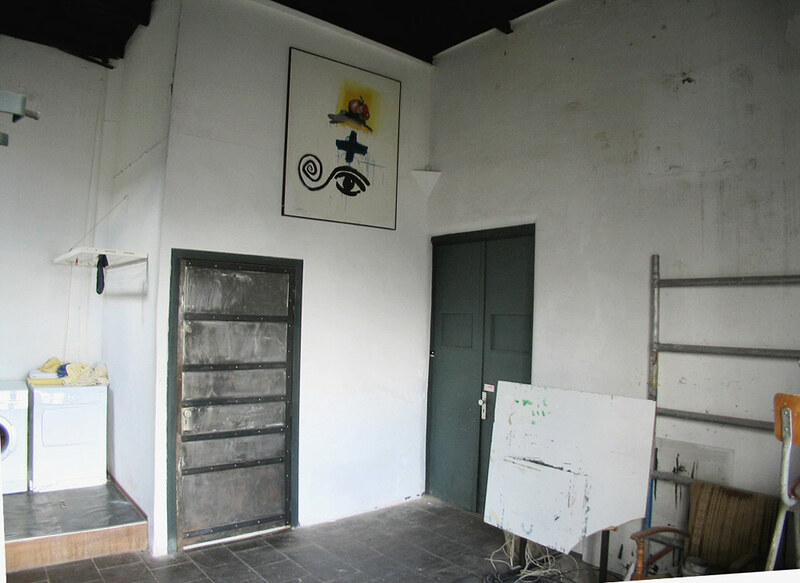 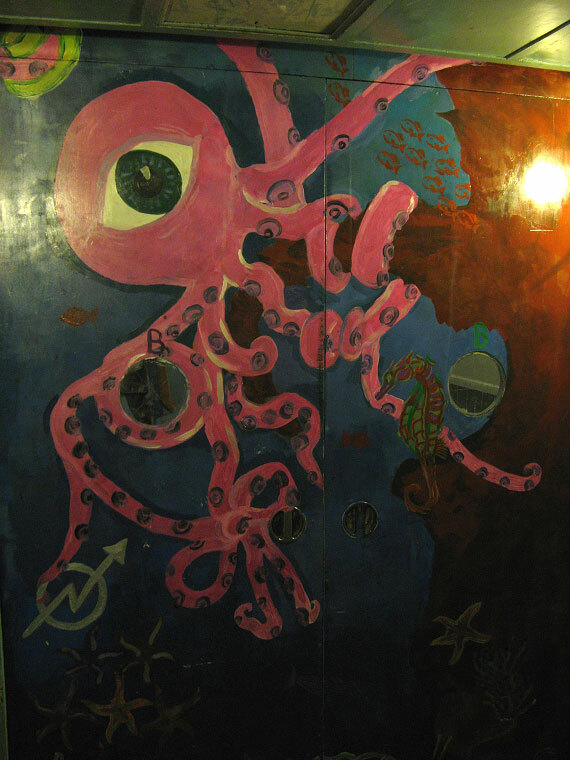 The lift has since had its character transformed by a top to bottom 'ocean' painting made by Tetterode young people in 2006 [Ref: NOTE-8: Tetterode's painted lift]. 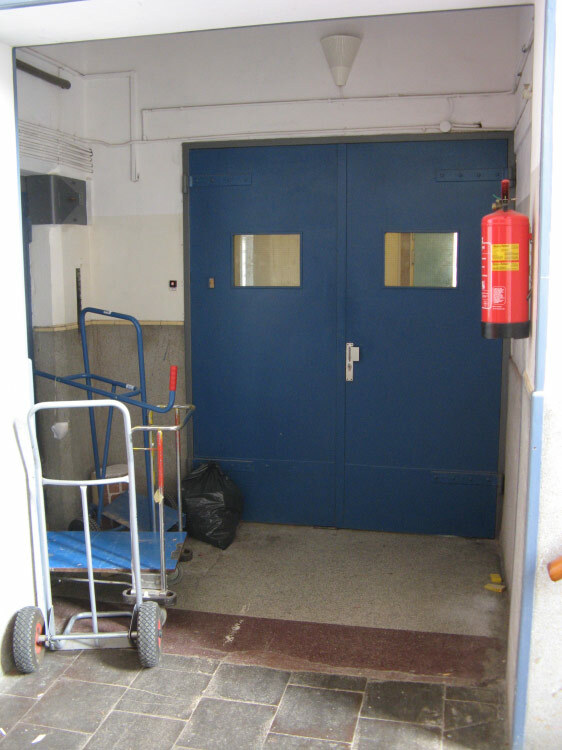 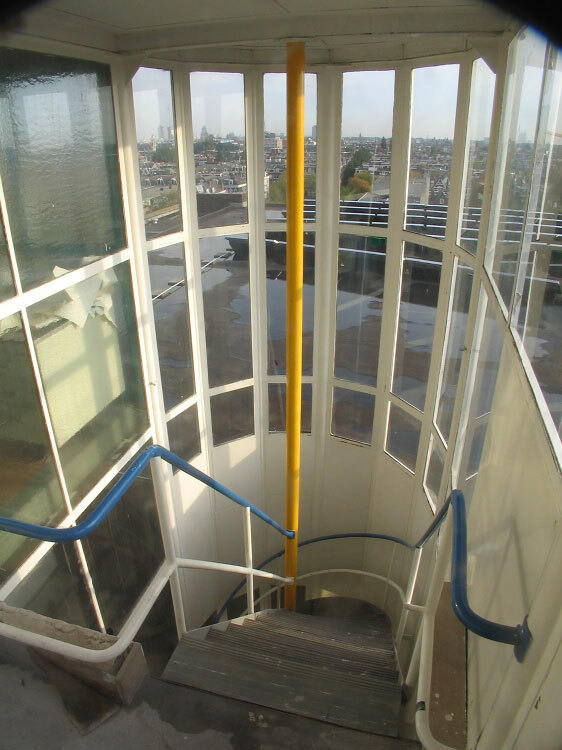 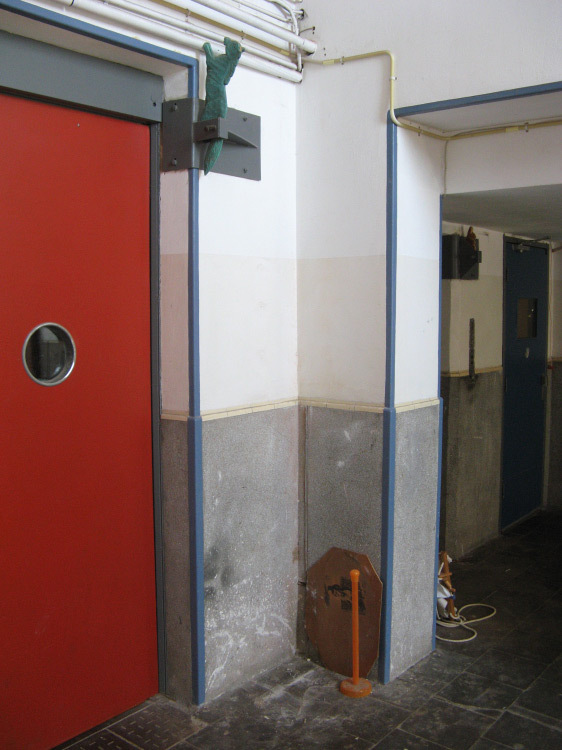 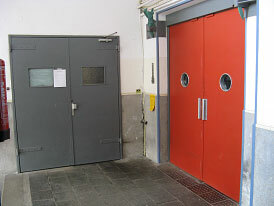 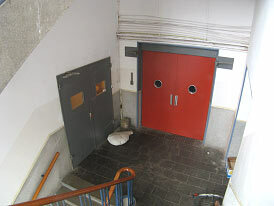 In the late 90s Tetterode's circulation routes were cleaned and repainted and the lift was given scarlet doors - the fascinating industrial grey gloom of the mid 90s was somewhat dispelled. 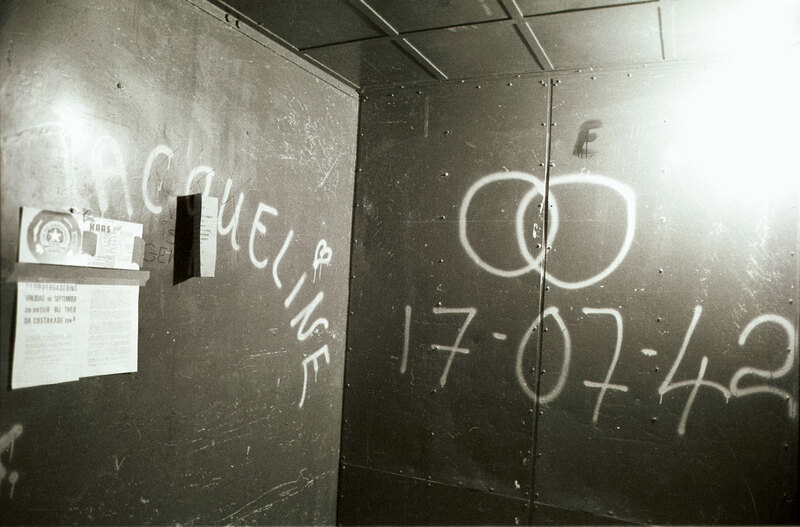 The lift interior of the mid-90s was austere dark dried-blood red with white sprayed text. 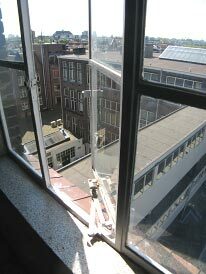 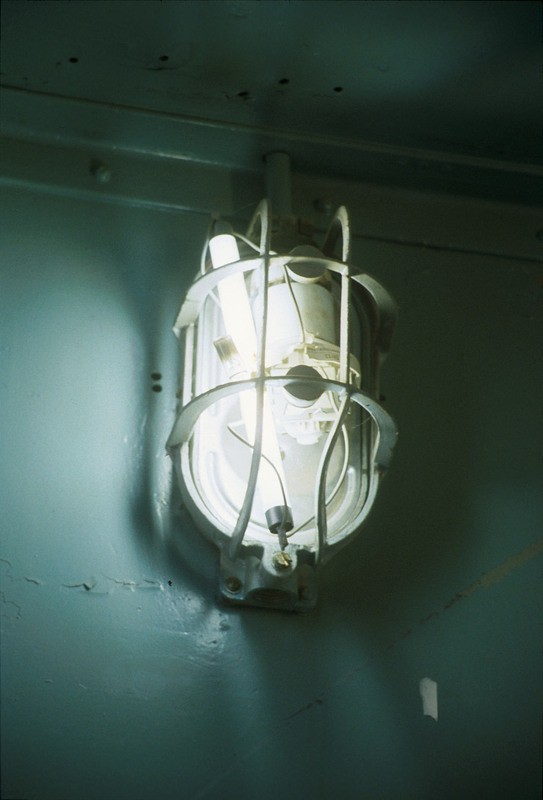 An economical adaptation: the lift lamp is used as a kind of glass pot in which stands a (fragile) flourescent tube, wired to the bulb terminals. 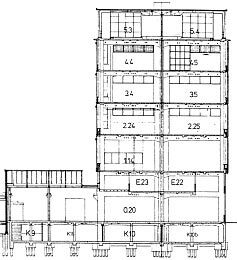 Level 1 is the only landing whose north-side Merkelback entry is recessed, forming a lobby to the "Entresol" work-space floor [mb1e]. An isolated apt opens on the east side [door right]. 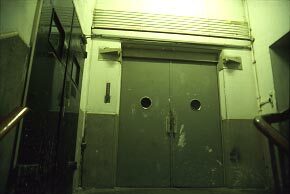 At night on the upper levels the reddened lift doors have hardly dislodged the sinister industrial gloom. 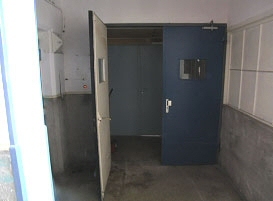 The entry door of enclave mb-L2. 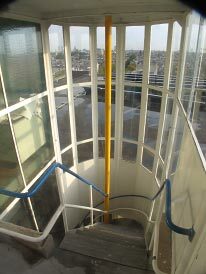 Levels 2 and 3 landings extend south into Hartcamp enabling access to the L2 and L3 bridges to the west-side Bilderdijk old building. This is the lower of the two bridges that connect the two residential blocks. 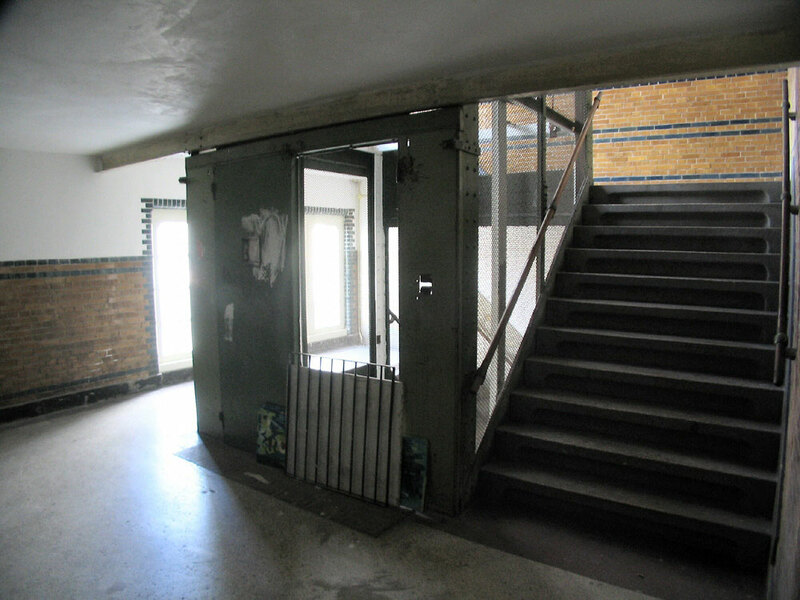 The entry to the left is into the bridge foyer. 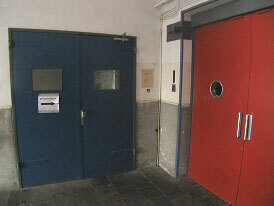 The lift's double-door faces us, the left double-door is Merkelbach L3 enclave. 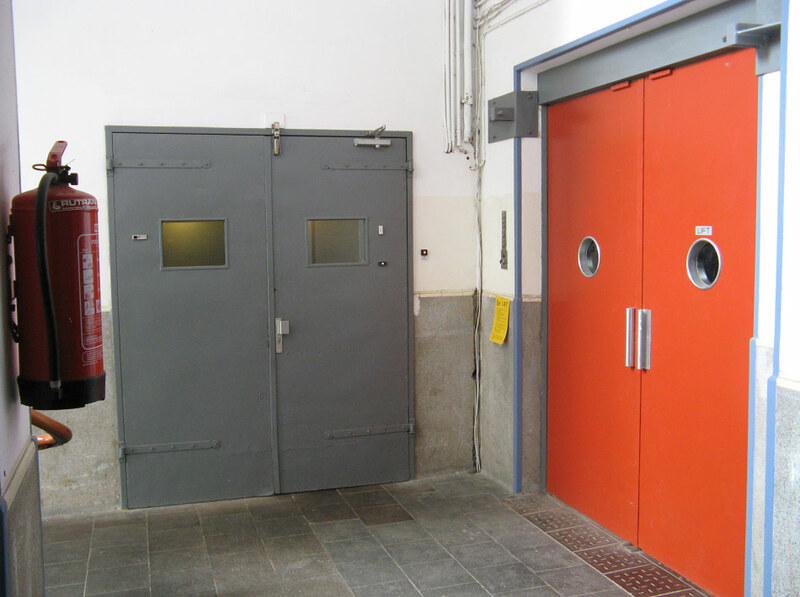 The right opening accesses the door of Hartcamp L3 enclave and the upper bridge to Bilderdijk. 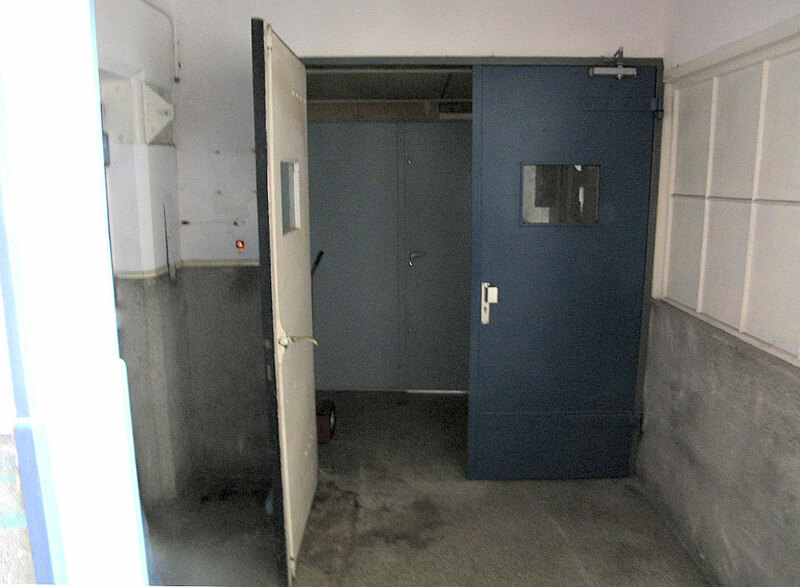 The entry door of enclave mb-L3. 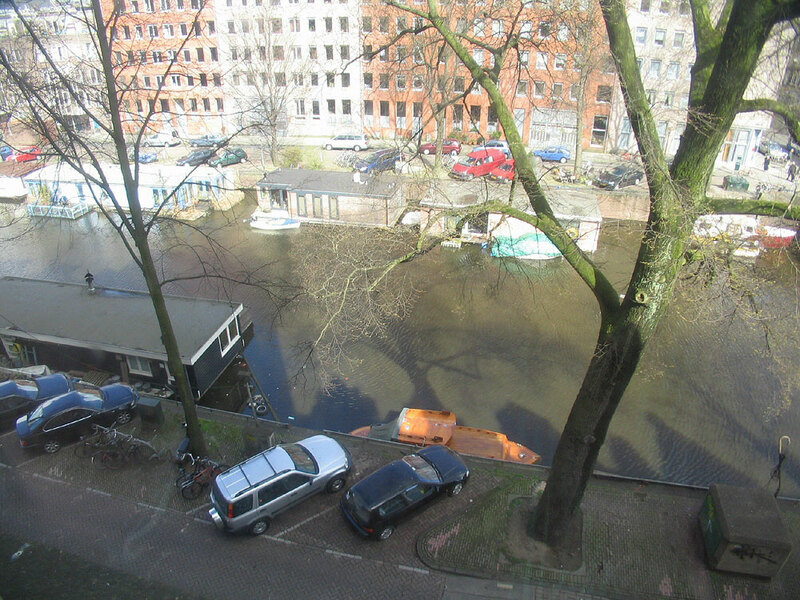 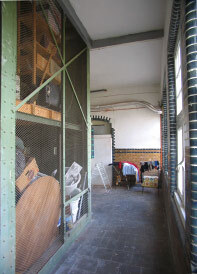 This is the upper of the two bridges that connect to Bilderdijk old building. 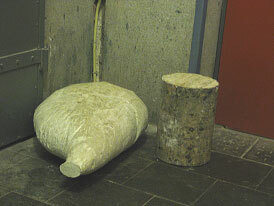 A mass of plaster that seems to have hardened in a plastic bag and a core cut through the thickness of a dc wall, probably during the 1986 gas installation. 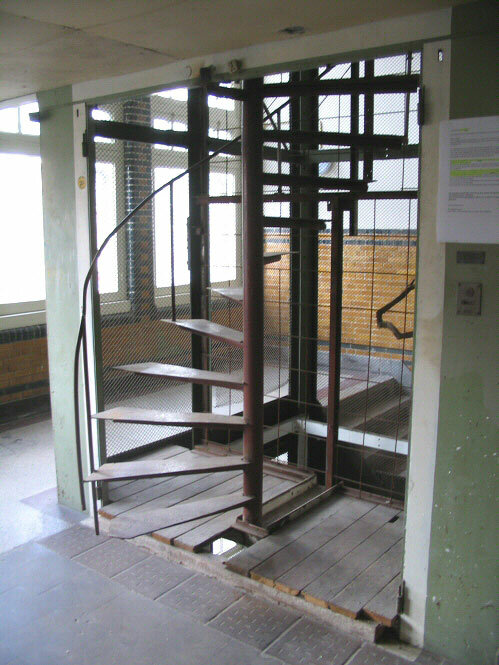 Adorning the landing's west side is the small steel enclosure of Merkelbach's elegant spiral-stair up to his little L7 'look-out' pavilion. 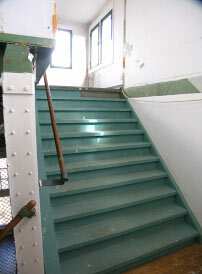 The east side of the ultimate landing. 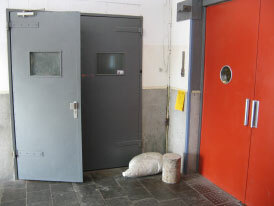 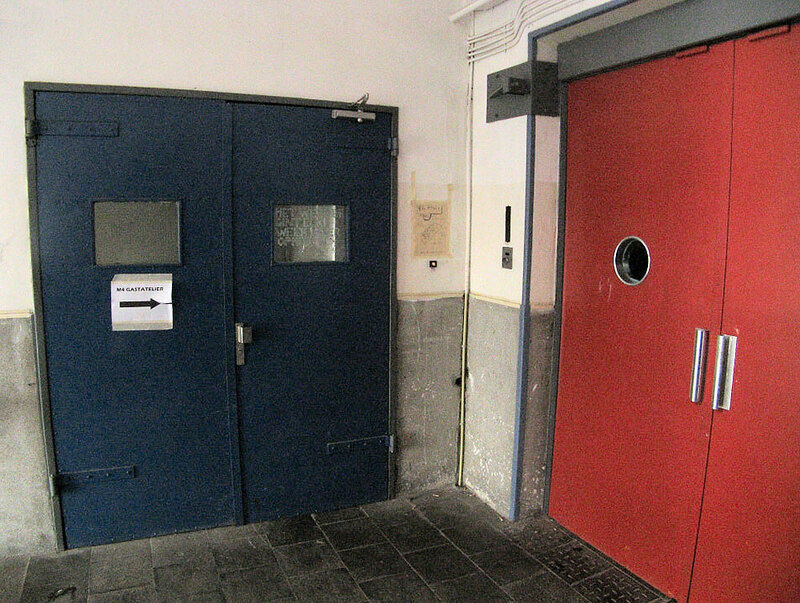 The centre door is the redundant passenger lift (the big freight lift terminates at L5); to the right is the lobby of the Hartcamp 'penthouse' and exit to the Merkelbach 'penthouse'. 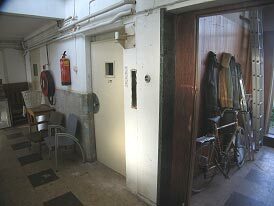 To the right is the door into Hartcamp's 'penthouse' - the directors' dining room, now Frank April's living-space and studio. 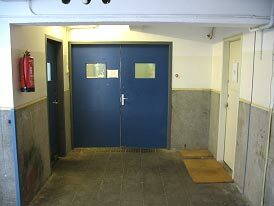 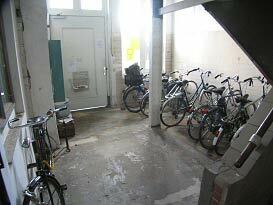 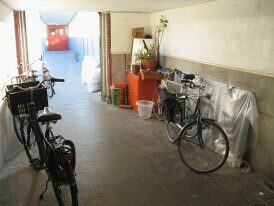 Ahead is the exit onto a small terrace from which the three Merkelbach 'penthouse' apts are accessed. Merkelbach's steel and glass enclosed stair up to his 'look-out' pavilion. 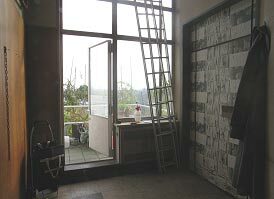 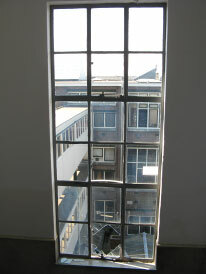 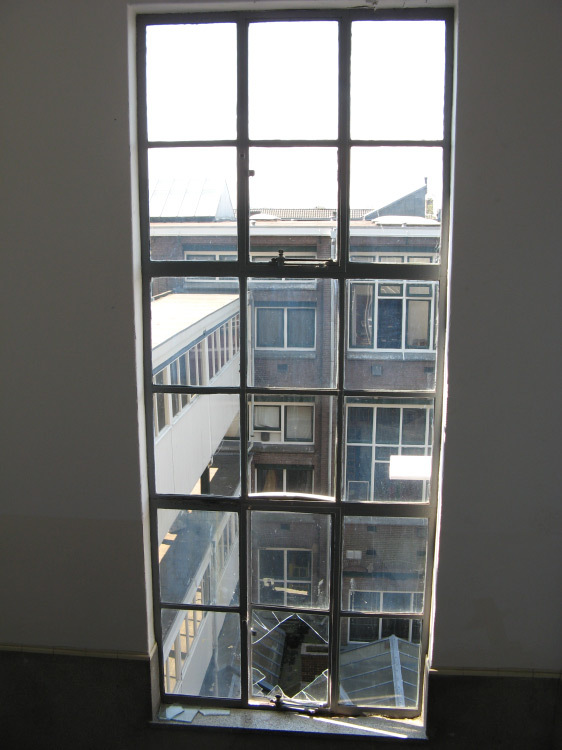 The 'look-out' room seen through the open door to the Merkelbach building's main roof. 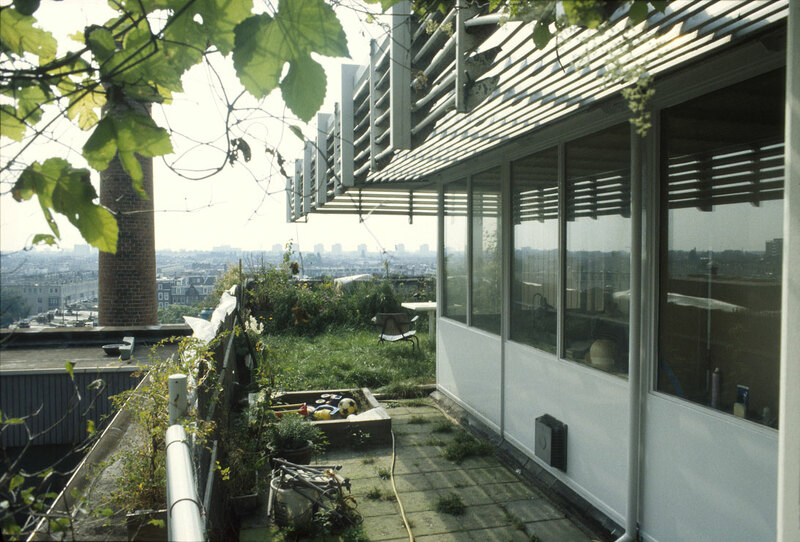 The look-out' pavilion from the roof of the L6 penthouse. The pavilion's door accesses boat-like steps to Tetterode's highest place - the pavilion's L8 roof-terrace. From the pavilion's L8 roof-terrace: a view over the L7 roof of Merkelbach's 'penthouse'. 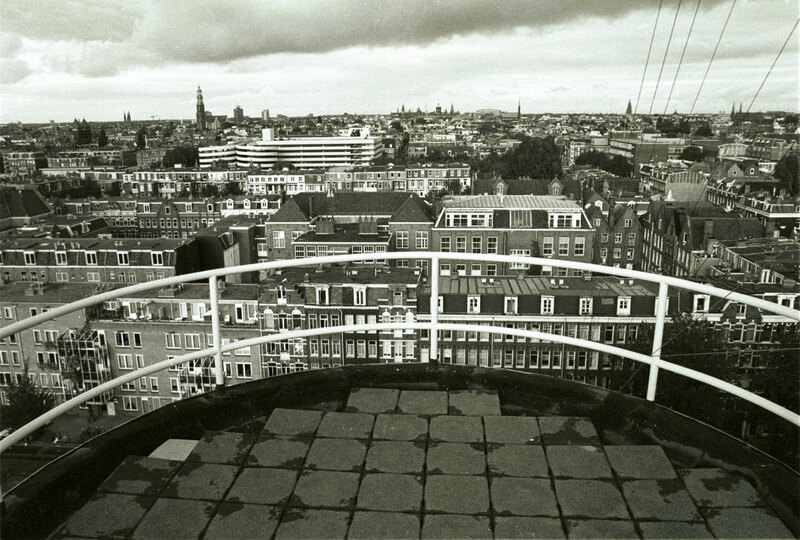 From the L8 roof: a view over the central-city. 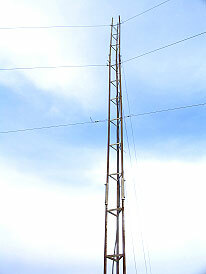 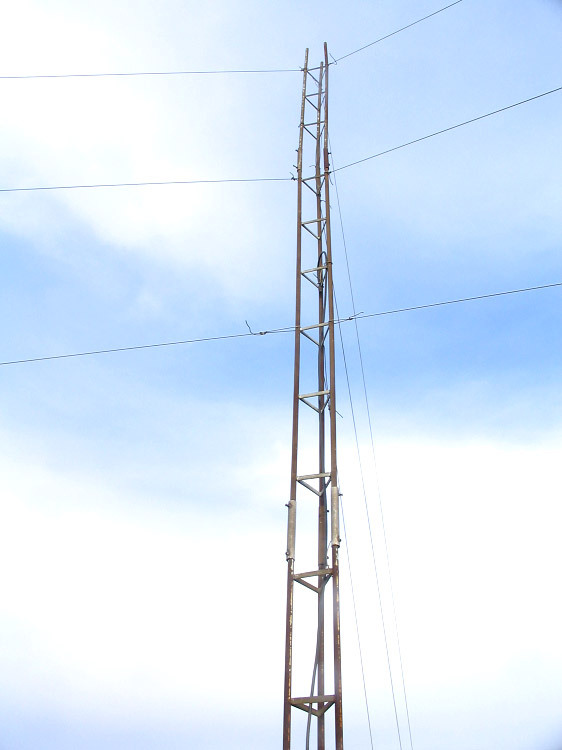 Radio-mast support-cables pass across the view to Merkelbach roof's south-east corner. 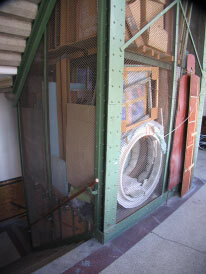 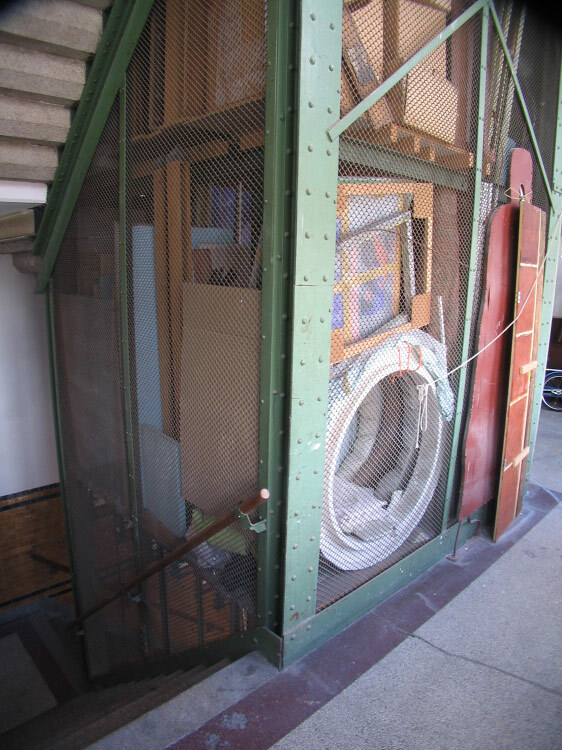 The redundant lift with its surrounding stair. 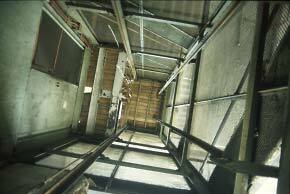 Our view up encounters two obstructions: at L2 a ledge of floor projects into the shaft supporting a spiral stair to an office in the upper half of L2's landing; at L3 the shaft is floored for store-space. 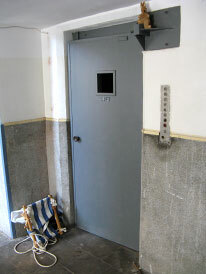 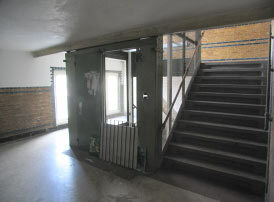 The lift doors have been removed, and a small lobby made that juts into the shaft: a plank platform backed with walls of concrete-reinforcing wire. 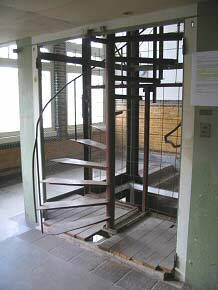 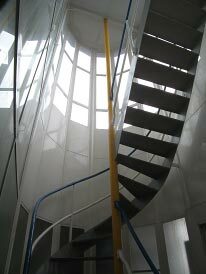 In this enclosure a delicate steel welded spiral stair climbs half the height of the tall landing, to a mezzanine office in its upper half. 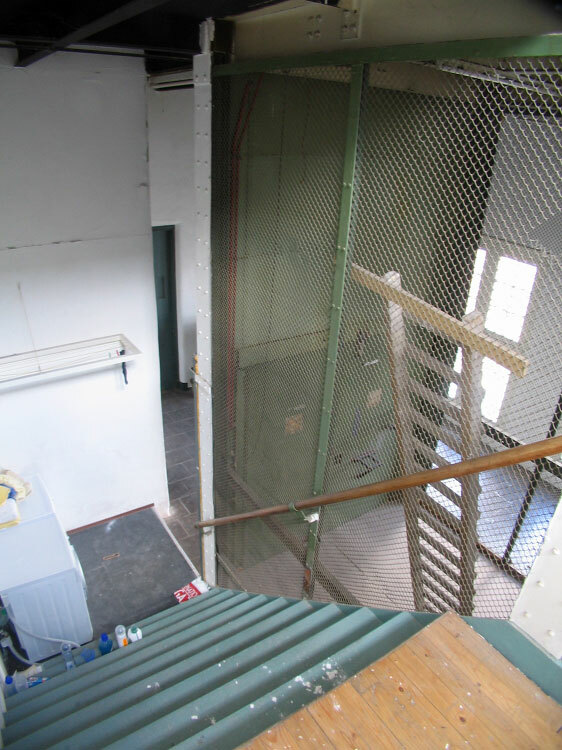 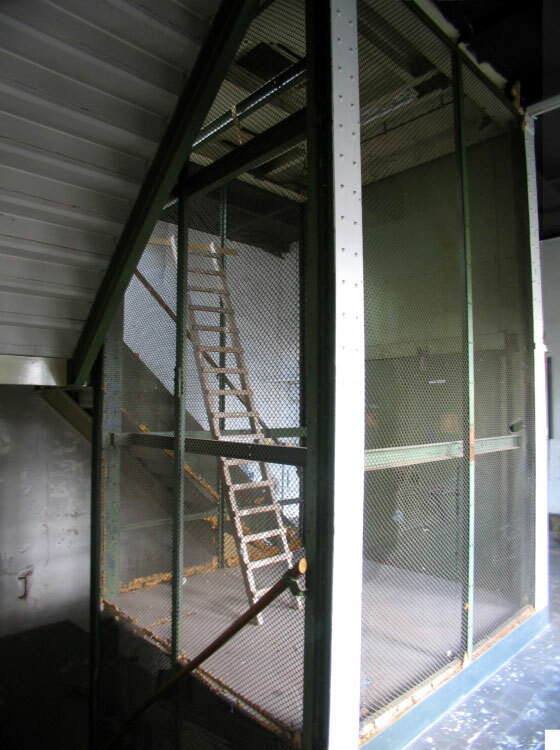 We are standing on the stair in the upper part of L2 looking down through the mesh of the lift-shaft and through the spiral stair's diaphanous 'cage'. 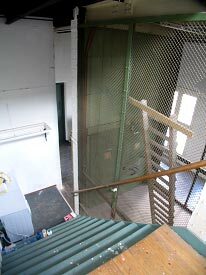 In the north upper half of the high landing's space a walled mezzanine has been built, with a blue 'front-door' reached by the flimsy spiral stair. In the 1990's this was an office which administered the needs of immigrant refugees. On this level, behind the barred doors, the empty lift-shaft is floored and serves for storage. 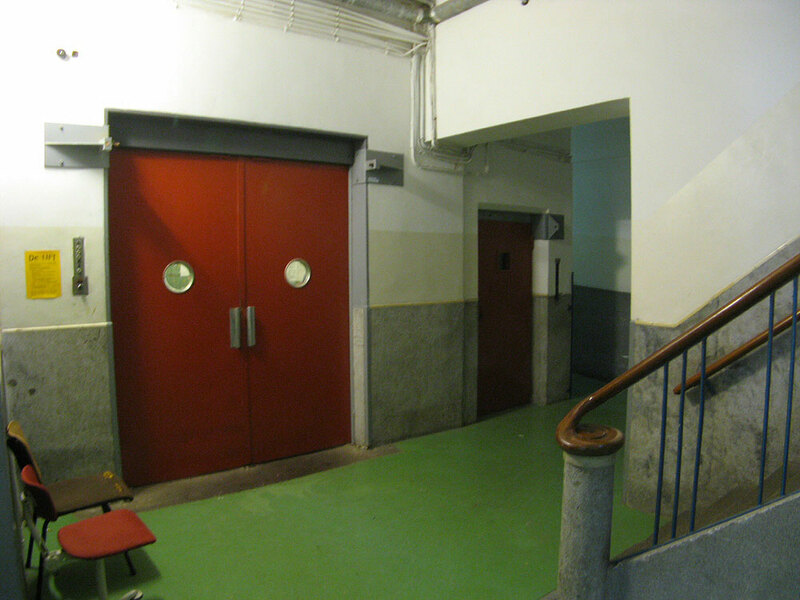 The room-sized main portion of each landing faces the (redundant) lift and has (locked) access doors to the south end of each floor-enclave. At the left is the south entry of floor-enclave L3, which uses the large landing to store a surplus of posessions. 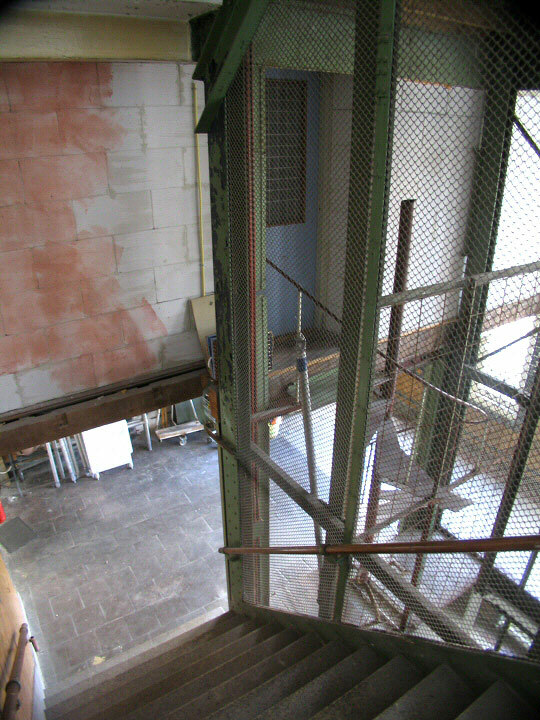 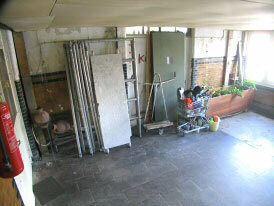 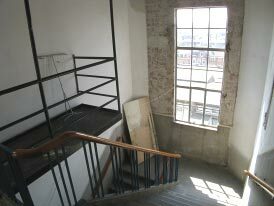 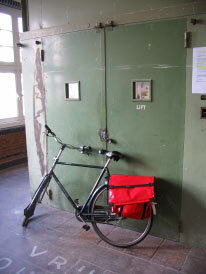 On this level also, the empty lift-shaft is (in 2006) floored and used for storage. 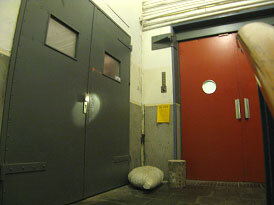 At the left is the south entry to floor-enclave L4; some of whose domestic/service functions have spilled onto the large landing. 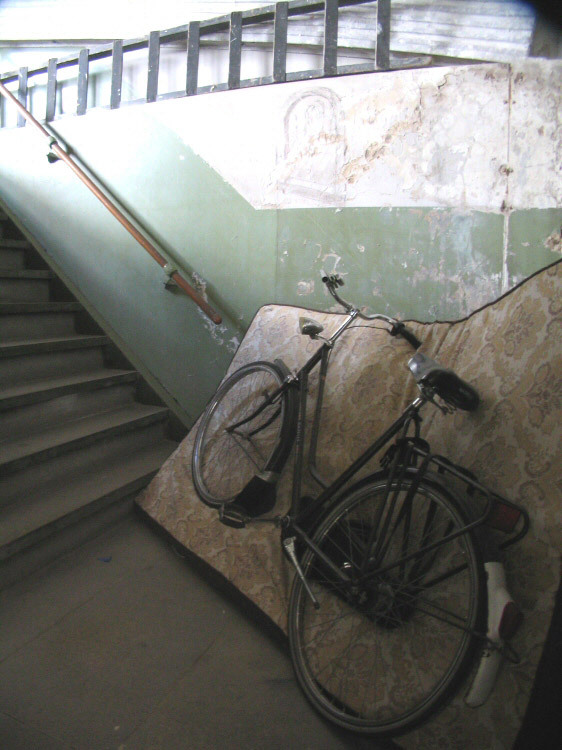 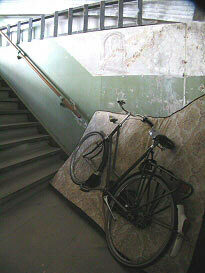 The strange pose of the bike amplifies the odd conjunction of stair-diagonals, horizontal ladder and ridged board; directing a disconcerting illusion of 'perspective' cues by its suggestion of purposeful leaping speed. 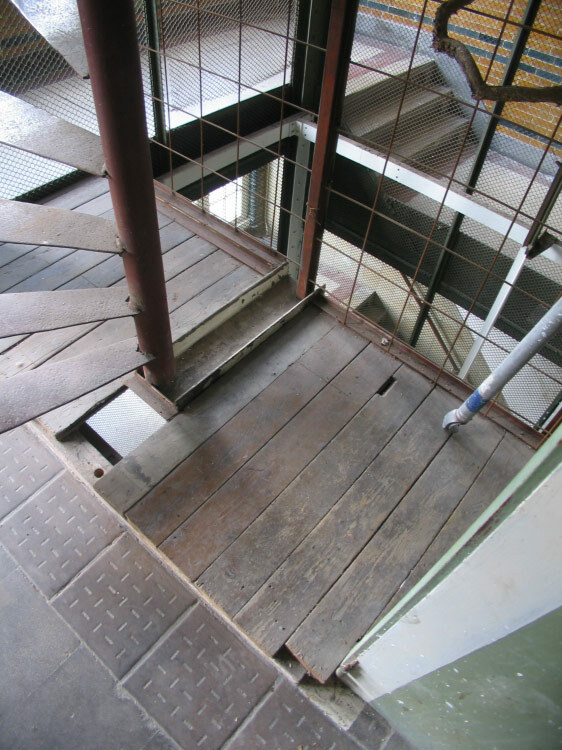 Its position is presumably practical - the slope of the mattress would have slid it to the smooth floor but for the ledge of hidden frame that grips the wheel. One of two living-spaces in Hartcamp independent of an enclave (the other occupies the whole L6 penthouse) opens its steel-barred front-door directly onto the L5 landing, and strews domestic accoutrements from there to the L6 terrace exit. 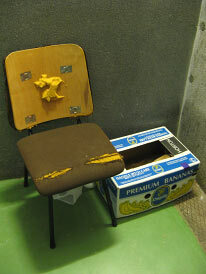 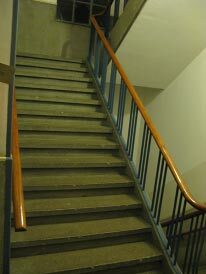 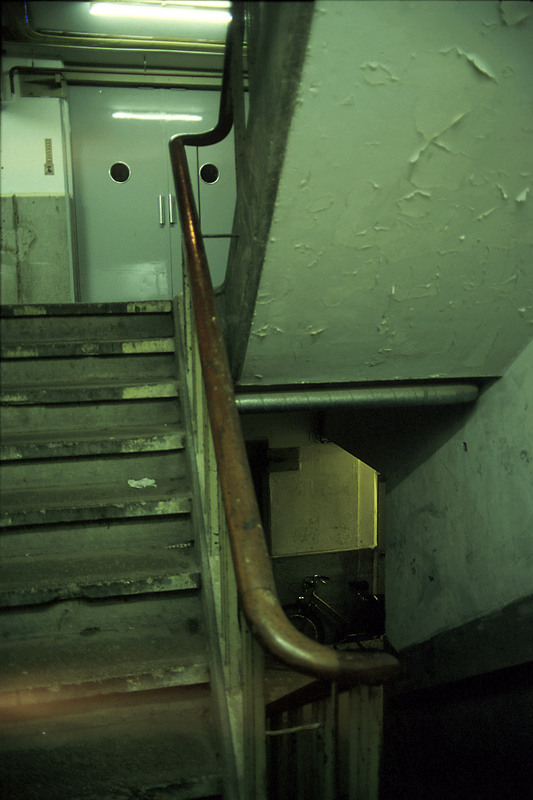 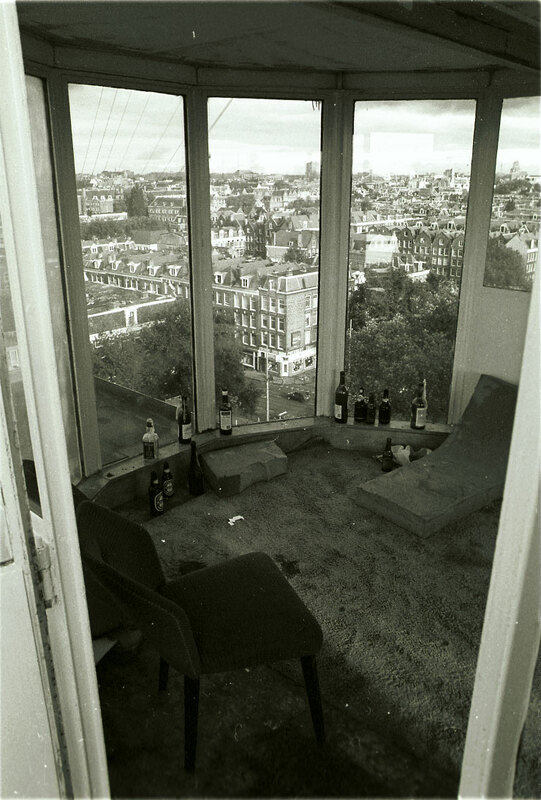 By 1993 the L5 apt had outgrown its bounds and furnished its neighbour stair and L6 above it with signs of domesticity. 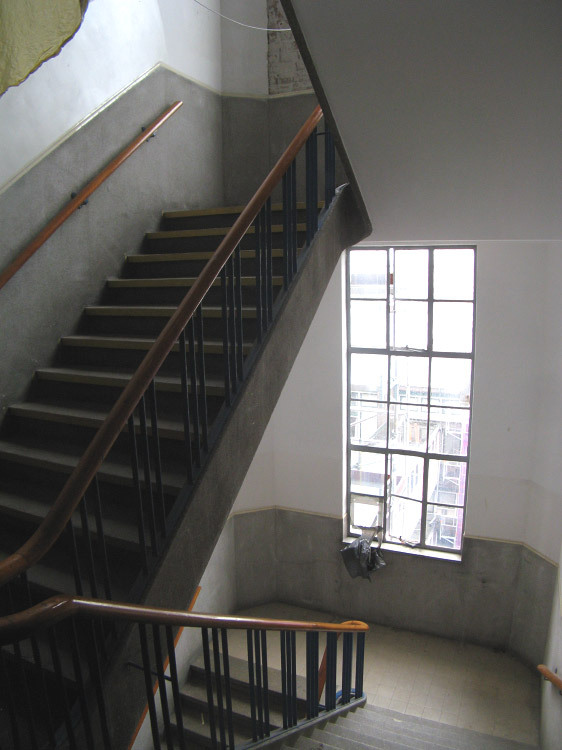 On reaching the final floor one realised the stair's low ceiling was a small room built over it and reached via a narrow passage above its rght hand side. 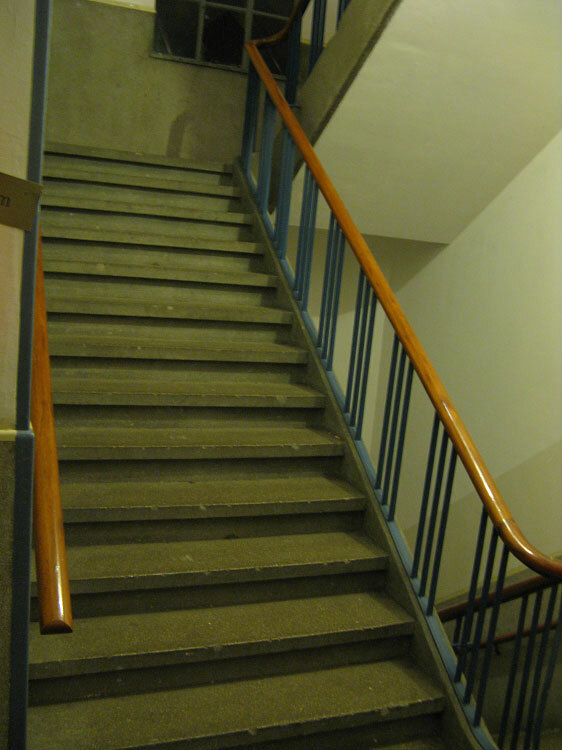 When next visited in 2006 the constructions that had intruded over the stair had been removed, probably under collective pressure and apparently after the late 1990s repaint - note remaining traces of their presence. 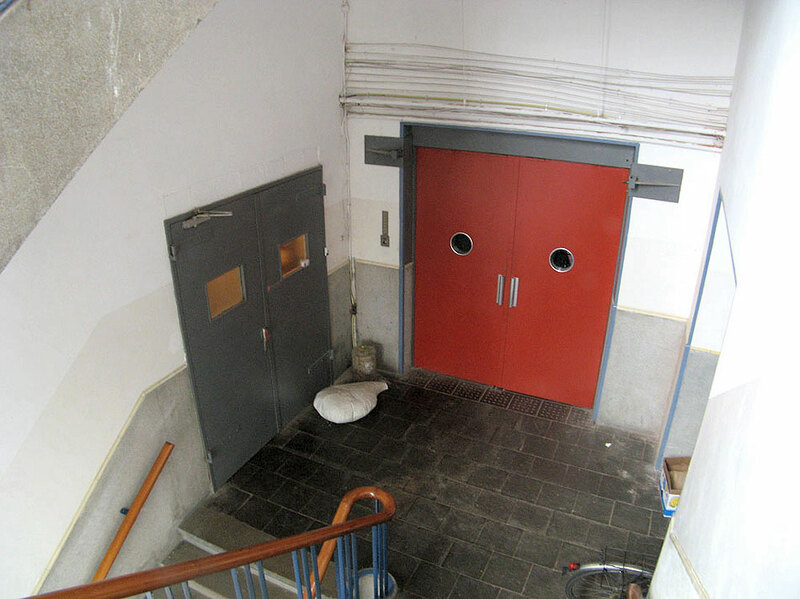 DACOSTAKADE L6: HARTCAMP CORRIDOR EXIT TO "SKY-LAWN"
Finally one reaches L6 and, after a few corners and doors - through what appears to be an outlying suburb of the L5 apt below - one finds a door to Hartcamp's final destination, a gardened terrace that I called the 'Sky Lawn'. The door in last picture from the outside - opens to a remarkable spatial suprise. 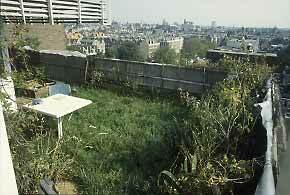 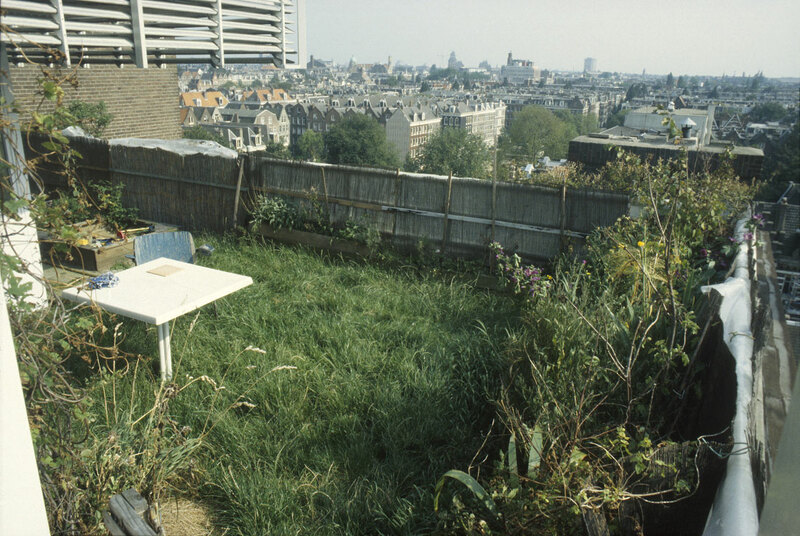 Past Frank April's bedroom (in the directors' penthouse) is a little garden on Hartcamp's SW corner, with views to the city's horizon and into Tetterode's centre Courtyard. 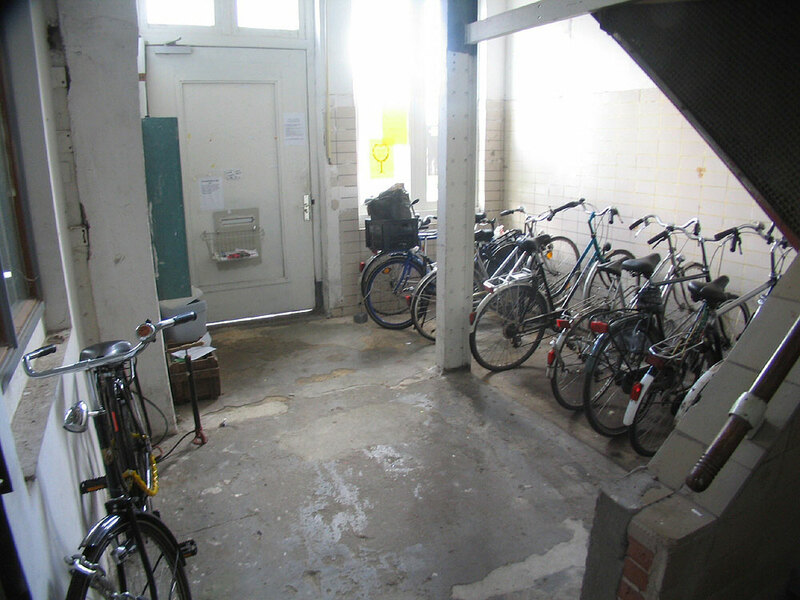 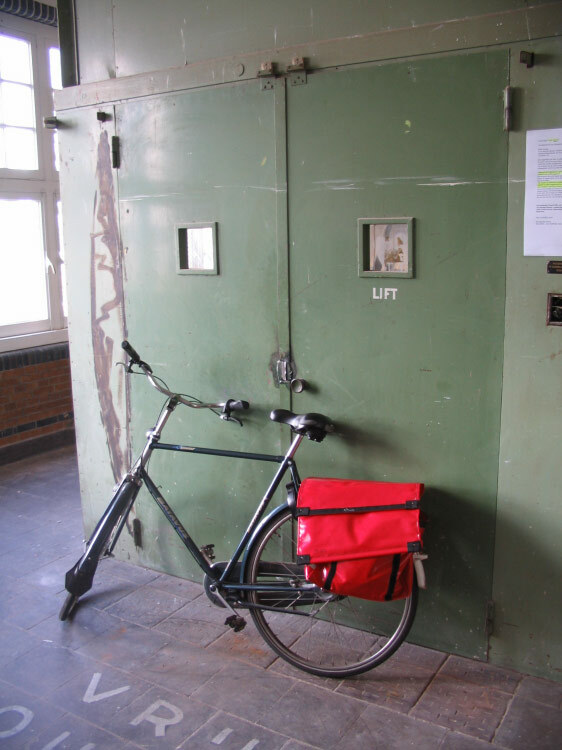 Unlike Merkelbach, whose enclave corridors wander between the walled-in studio/apts like 'leftover space' and would presumably be truncated cul-de-sacs if safety regulations had not required them to reach the external fire escape, Hartcamp's floors are open to normal access at both ends. Rising through every level at Hartcamp's SE corner is a large lift encircled by a stair (2-bays long and almost half the building's width) and room-sized landings with locked doors to its enclaves. 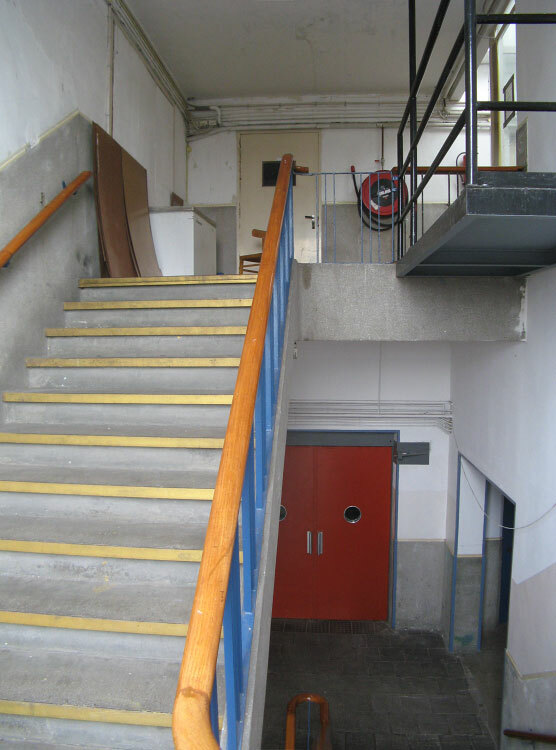 Thus, unlike Merkelbach, that shares the Dacostakade Central Stair with every user of the block, Hartcamp has its own exclusive access directly from the street (and room-sized landings on all levels of this stair, plus a floor-sectioned lift-shaft for storage). 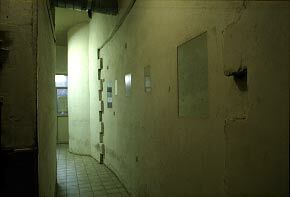 It seems possible that (at least on L1/2/3/4) that Hartcamp's bracketing entries may have focussed the 'straight throughness' of its enclave corridors and thus the disposition of its apts, whereas Merkelbach's wandering access-ways are what one would expect where a (relatively benign) competition for maximum living-space is of primary concern, when space divisions grow ad hoc and enclave access corridors are, in terms of routine use, cul-de-sacs. Noticable in the mid 90s was a new stage in the evolution of Dacostakade’s living-spaces: the advent of elaborate, self-contained, sometimes ‘family homes. 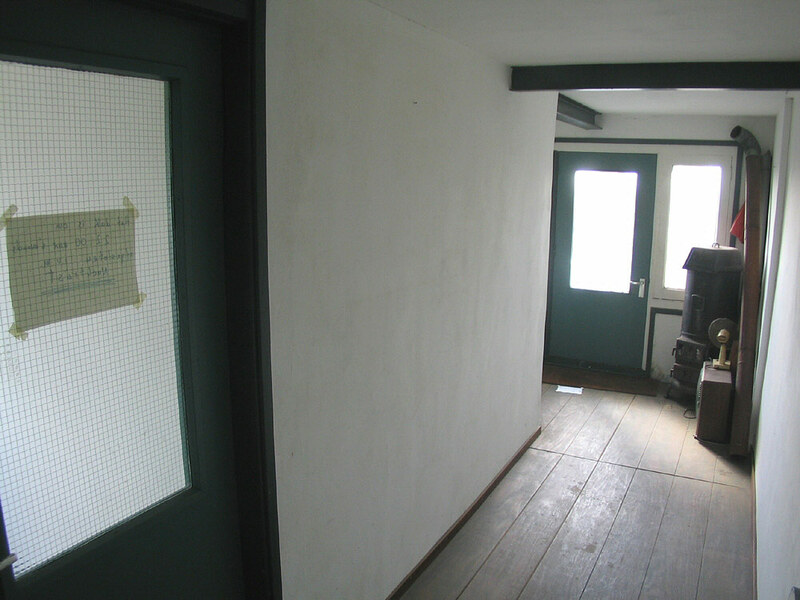 However at that time, apart from an extraordinary example in Hartcamp , this development was almost exclusive to Merkelbach where spaces are usually large enough to contain ‘houses’ rather than ‘elaborated bed-sits’, and where as ‘working-artists’ the inhabitants seem more independent of each other - bound together, if at all, more by shared responsibility for work conditions than sociability. 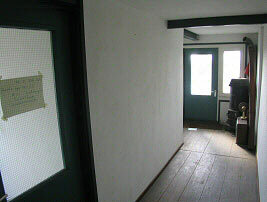 Inside Hartcamp's more vocationally mixed floors the sense of a social-enclave is strong  - reinforced by the straight centre corridors whose rows of apt doors visibly signal 'sharing'; exhibited in the obviously shared telephones, bathrooms, and socially used sitting/eating rooms with pictures, tv, sofa, and ‘private’ domestic objects ‘lying around’; all affording a 'hostel-like' atmosphere - very different from (for instance) mb-5’s tiny ‘left-over’ tiled cooking-space, with its empty cupboard and dusty drainer! 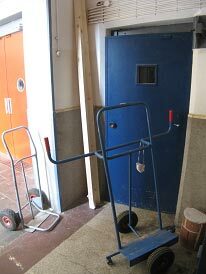 [mb-5 Kit]. 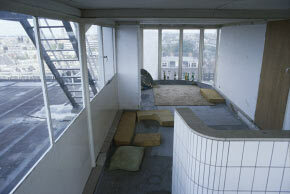 INA HEUVEL/GER BERGEVOET APT [hc-L4] p8. It's interesting to compare the SILO’s joined-up ‘neighbourhoods’ with Tetterode's closed dc and bd floor-enclaves. 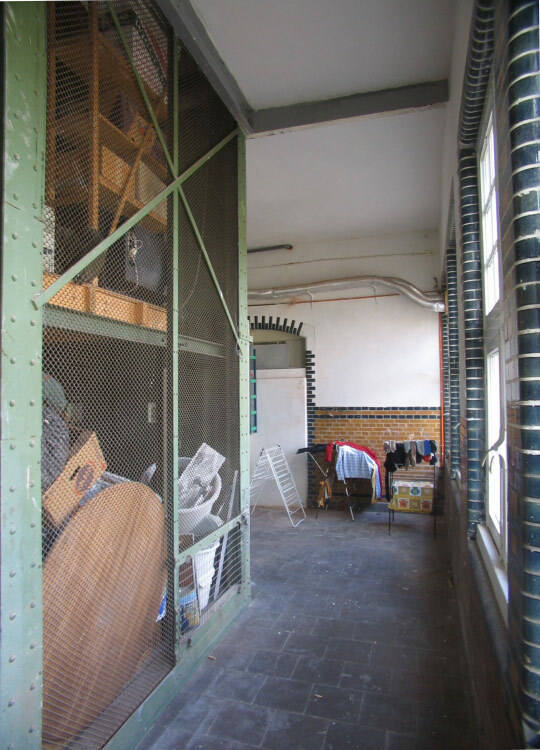 Tetterode's are socially-local, ‘safe’, locked, like shared hostel floors - unlike the SILO where apt facades open onto open-circulation 'streets’ that may be ‘furnished’ with shared ‘pissoirs’, bathrooms, store-spaces, but never kitchen-diners and telephones!